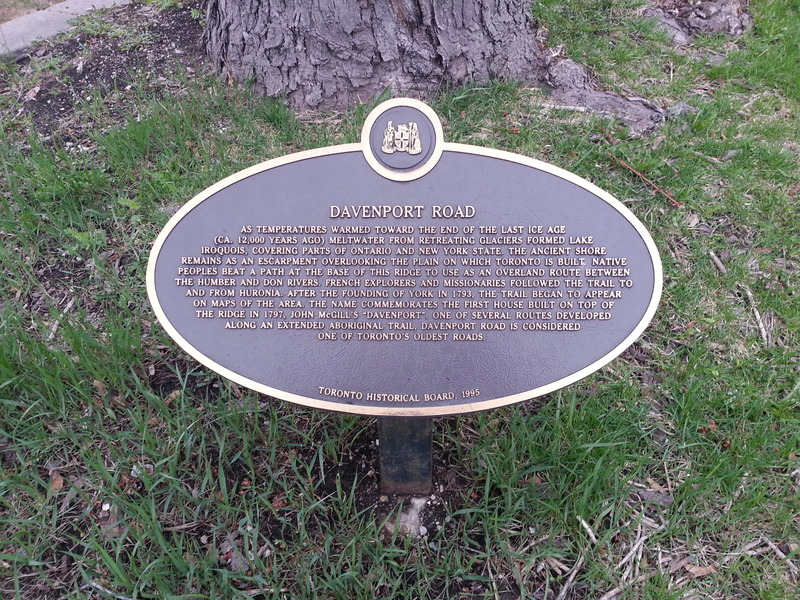 The journey begins on Dupont street at the northern terminus of St. George Street. Across the way is the very yellow Pour House pub, which much like the rest of the structures on the street is a converted 18th century home. These businesses are all huddle together to make the Dupont By the Castle BIA. Fact: Toronto is the originator of the BIA. This still, in many ways, is an industrial area. 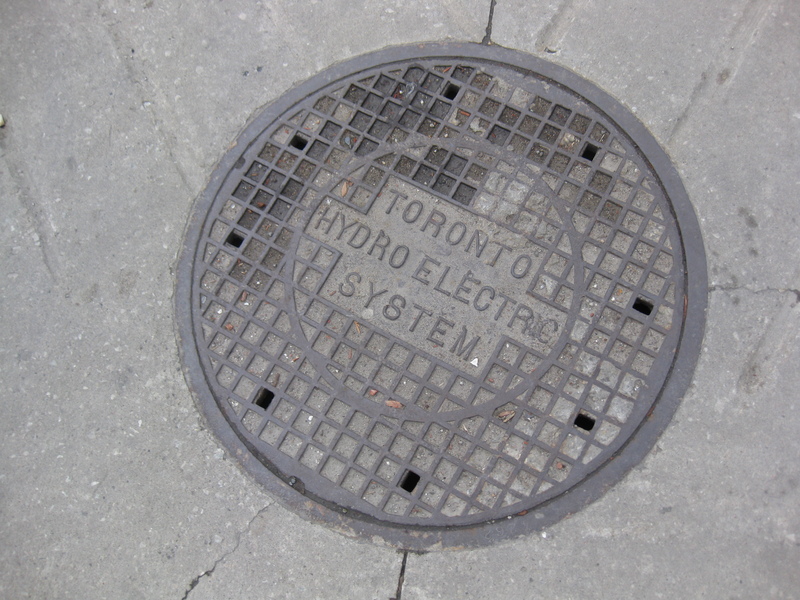 Manhole covers hiding the buried Toronto Hydro lines tell me that. But it’s also a industrial area looking to be something else. 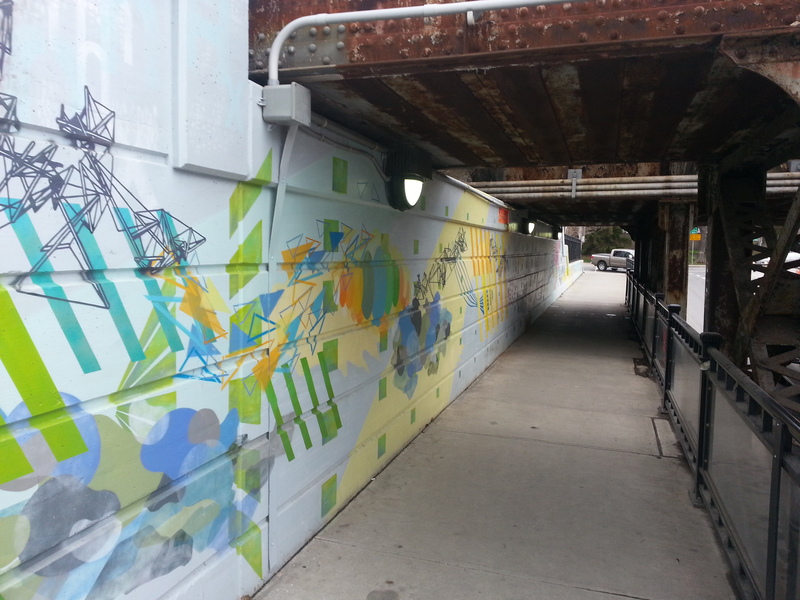 The railway overpass on Davenport is a perfect example of that. 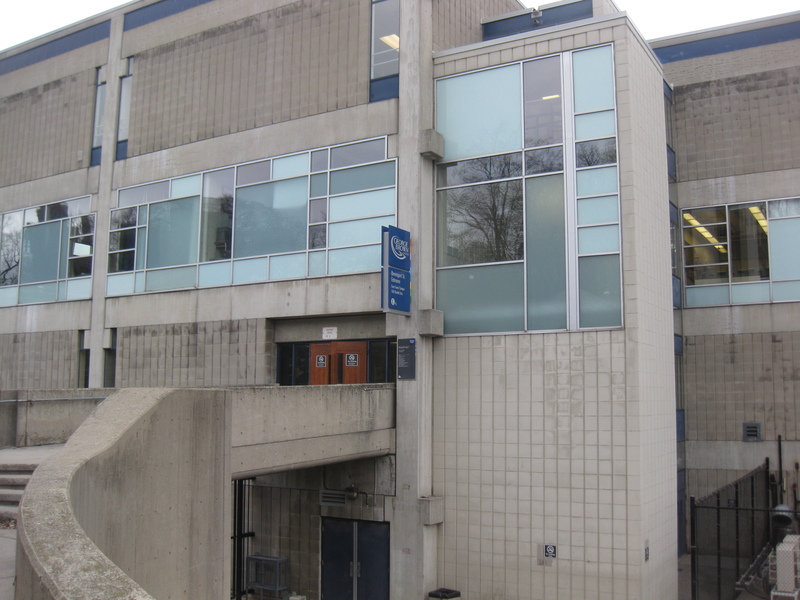 It’s ugly and it’s grimy. 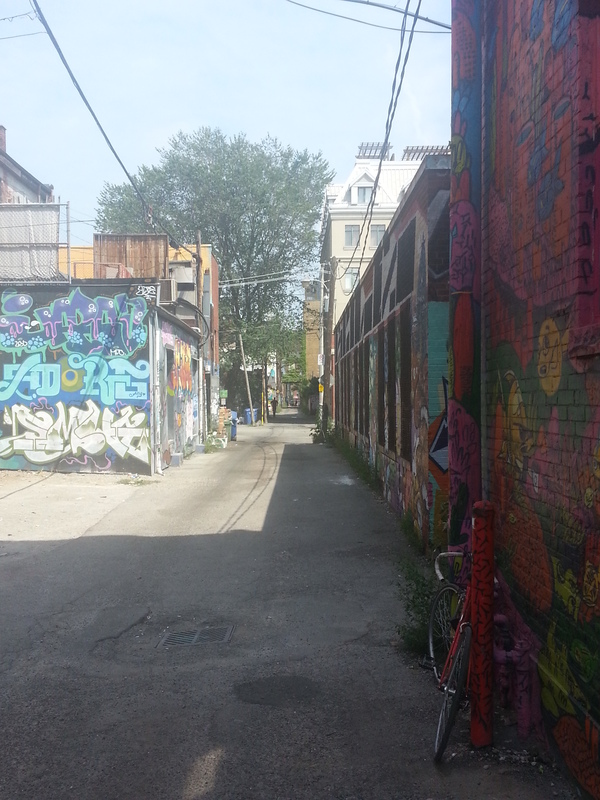 But like our alleys, someone (or many someones) has taken this dead space and injected from life and creativity. On the other side of the tracks (hmm, that sounds more menacing than I intended it be), Davenport meets Macpherson and Poplar Plains to make an odd intersection. It’s not very pedestrian friendly for someone trying to go from west to east, as I am now. Given that, OK, maybe the other side is a bit menacing. 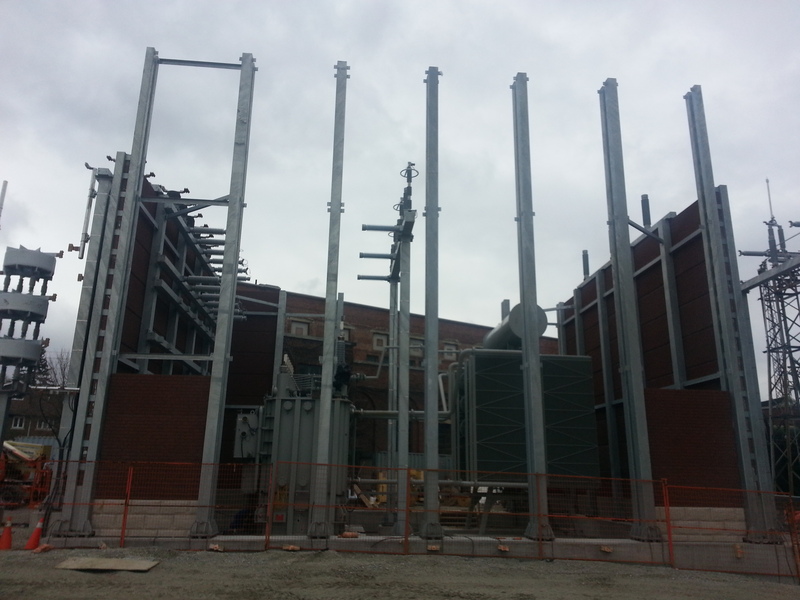 Finally mustering it, I come to the massive Macpherson Avenue Substation. 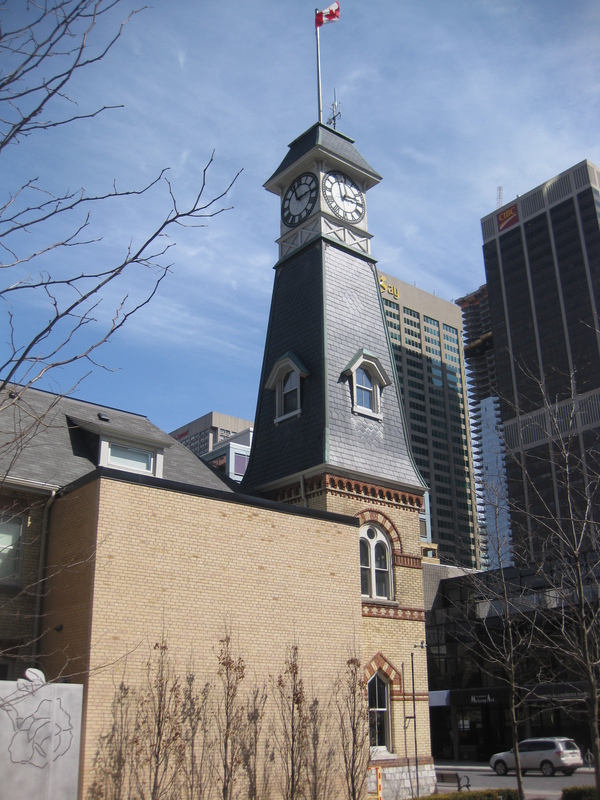 Completed in 1911, it was designed by city architect Robert McCallum who also did Yorkville Public Library and many early 20th century firehalls, among many other city owned buildings. Across the way is warehouse looking thing. I don’t know what is or was, but I like it. Keystones! 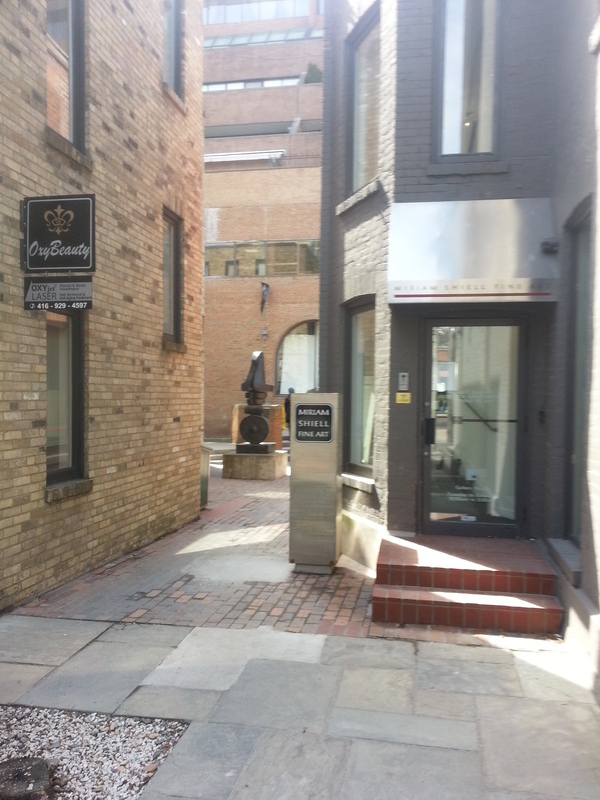 Next, I follow Rathnelly up, a charming street which shares (or lends?) its name to the area’s moniker – The Republic of Rathnelly. How and when did a micro-neighbourhood become a state, you ask? I had to ask as well. 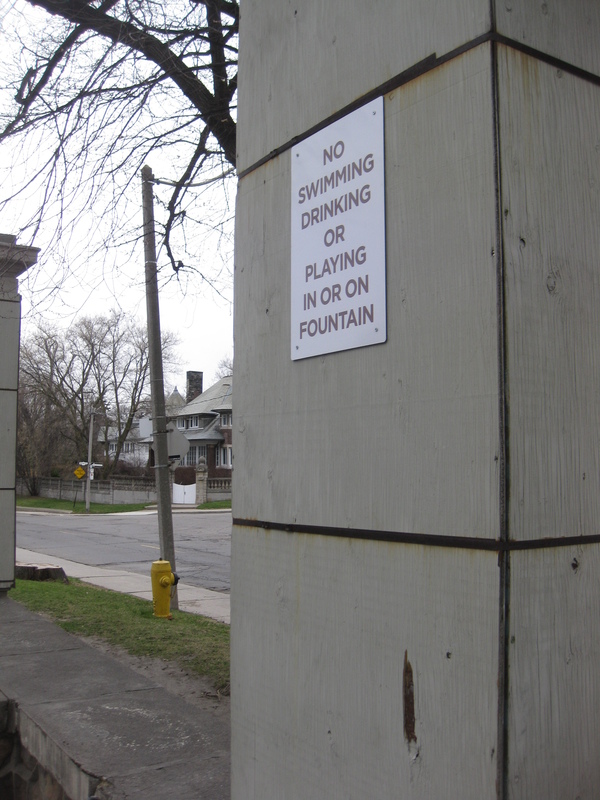 The answer is it’s one big inside joke dating back to the 1960s when the areas residents ‘broke away’ from Canada. 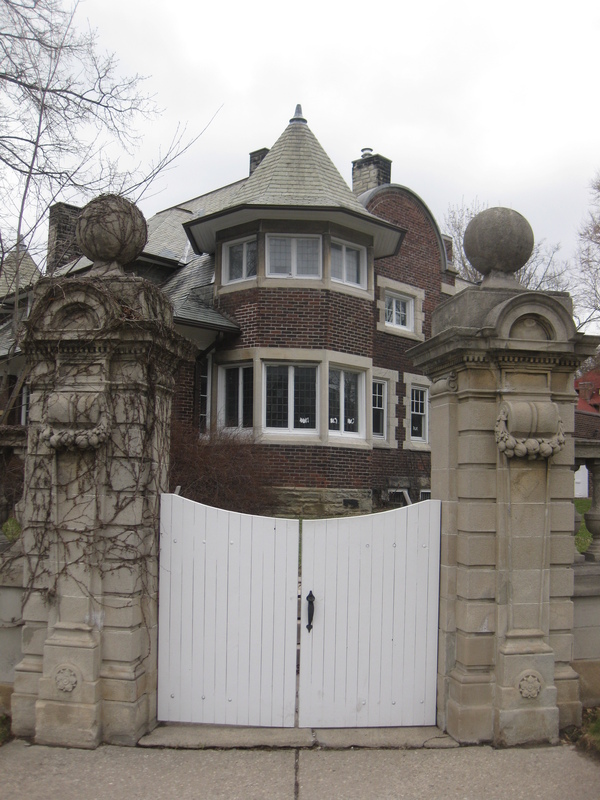 Around the bend is High Level/Poplar Plains Pumping Station, another McCallum project from 1906 (with subsequent additions). Our Rathnellians (?) ‘occupied’ it while in ‘negotiations’ with the Canadian government. 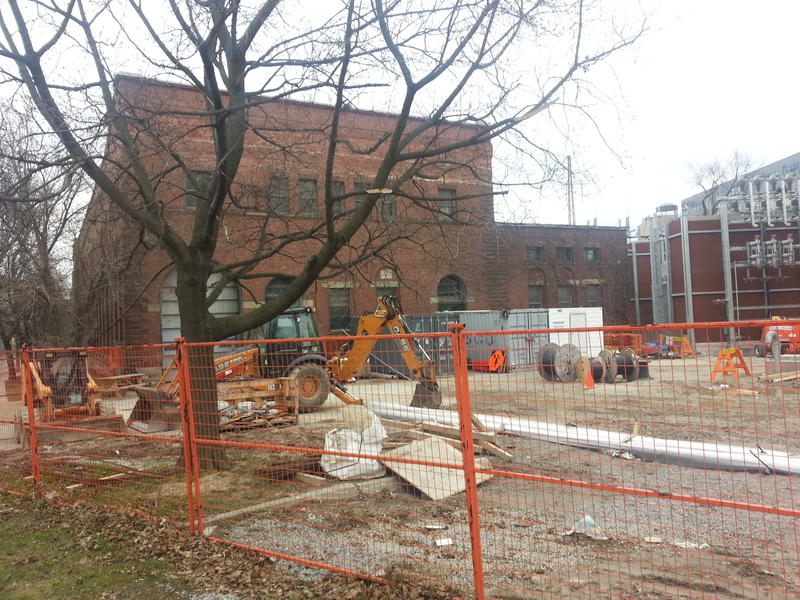 It’s interestingly the second water plant on the site, replacing the old Yorkville Water Works. I make my way around and marvel the outside. 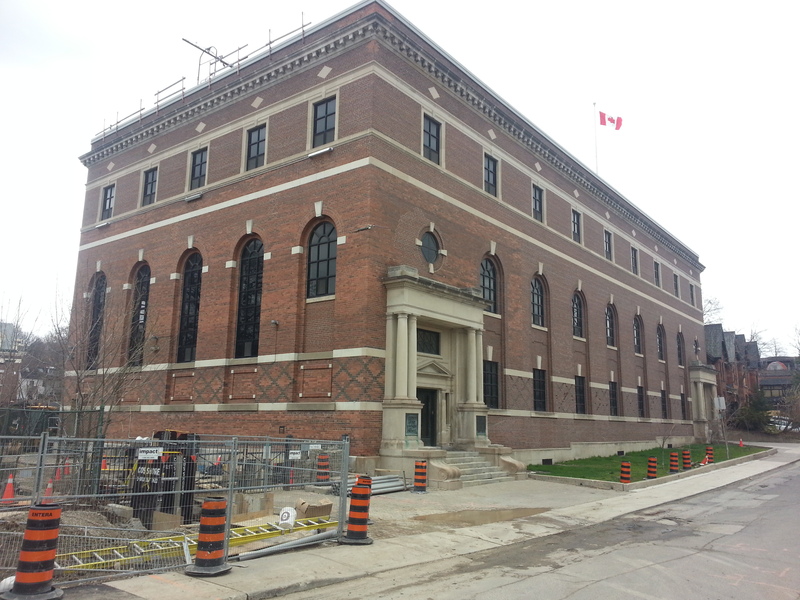 There will never be another infrastructure building in this style again. And really, that’s for good reason, isn’t it? Things have to evolve and be of their period. 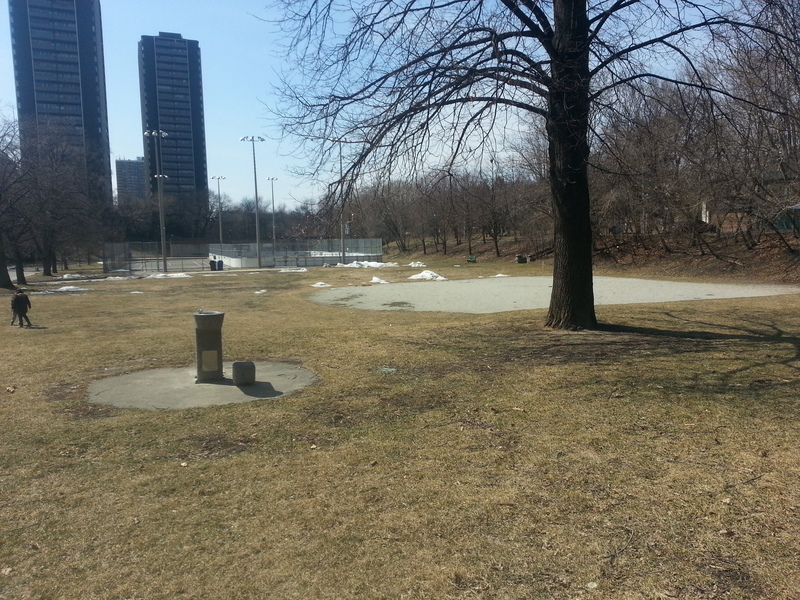 Leaving the water plant, I pass through the floating island park that is Boulton Parkette and continue up Davenport. 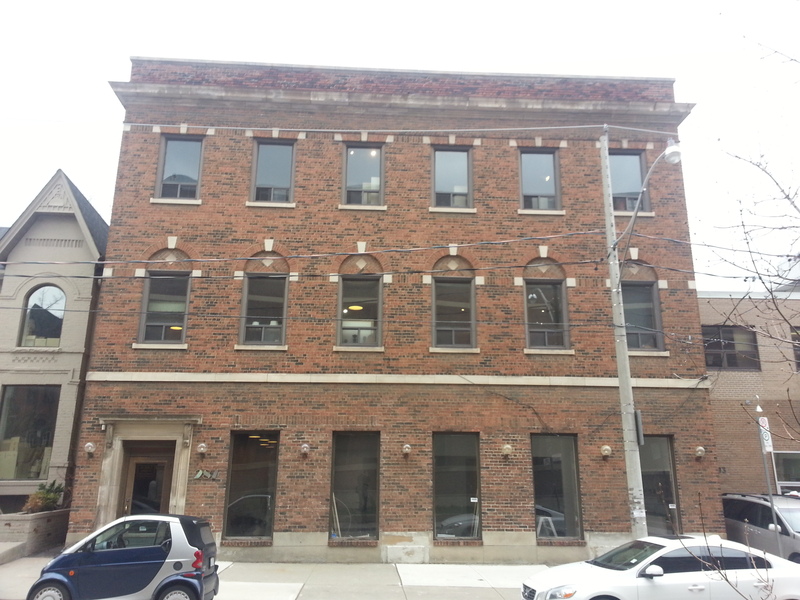 I come across another power building, this time Bridgman Transformer Station, 1904. 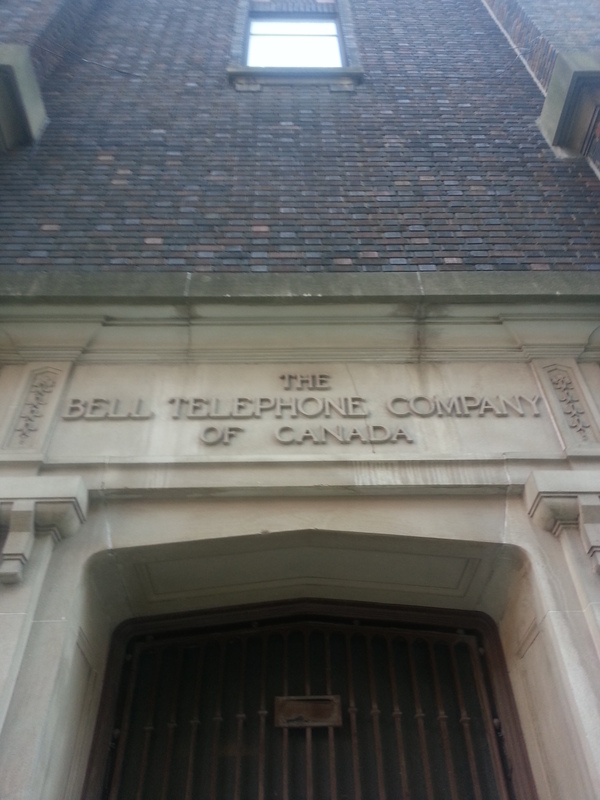 Now operated by Toronto Hydro & Hydro One, it was originally designed for the Electrical Development Company, of which Sir Henry Pellatt of Casa Loma fame (more in a moment on that) was the president. In April 2015, it looks like there’s more work to be done. Moving past the transformer station (and another weird three-way intersection), I continue along Davenport. At Madison, an orange building catches my attention. It stumps me. Waldorf? What’s that? Well, turns out it’s the Waldorf Academy, a private school which uses an alternative educational approach – one that’s holistic and multidimensional. Hmm, the more you know? Davenport hugs the escarpment left behind by the ancient Lake Iroquois. 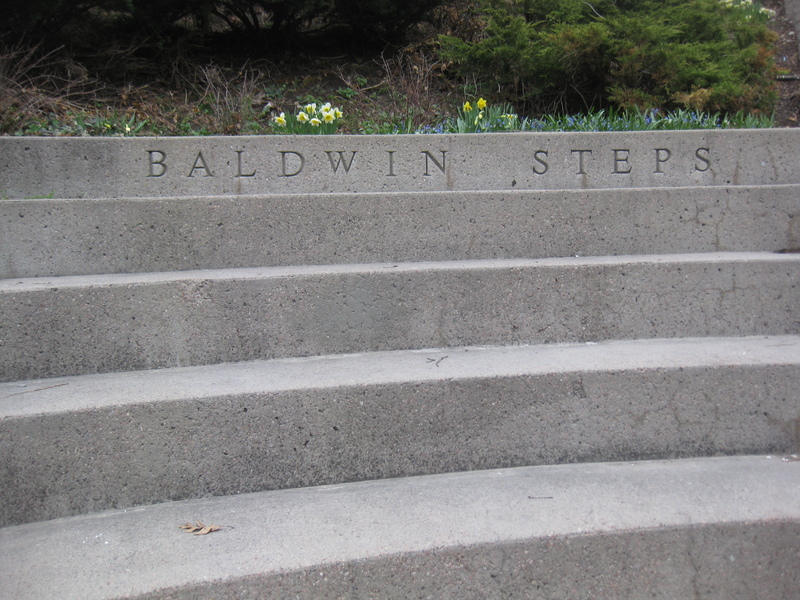 The way up the hill is the Baldwin Steps, which are located up the street from the Toronto Archives. It’s been a long while since I’ve navigated them. In fact, I have very vague childhood memories of making the climb. There are joggers working them as I ascend. I envy them. They attack it so effortless. Meanwhile I have to catch my breath and relieve the burning in my thighs. The top of the hill and the entire area at large is marked by two neighbouring museums. 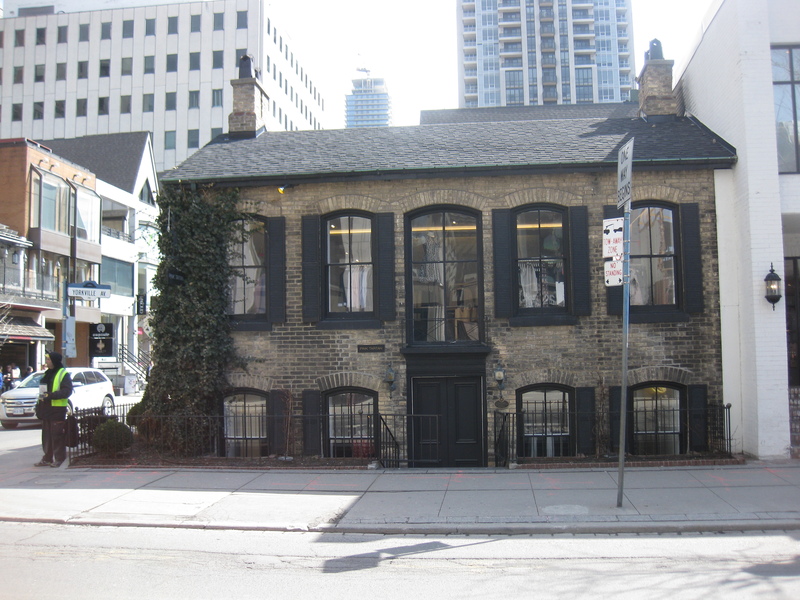 The first is Spadina Museum House and Gardens. 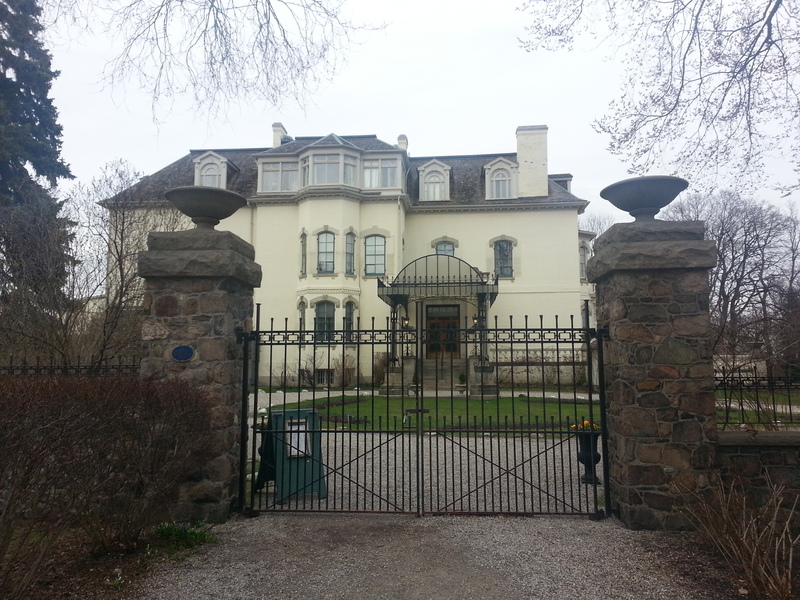 It’s the 1866 manor of the Austin family, now a City of Toronto Historic Site restored back to the 1920s. It’s after closing time, so I can only admire from behind the gates. Next time. 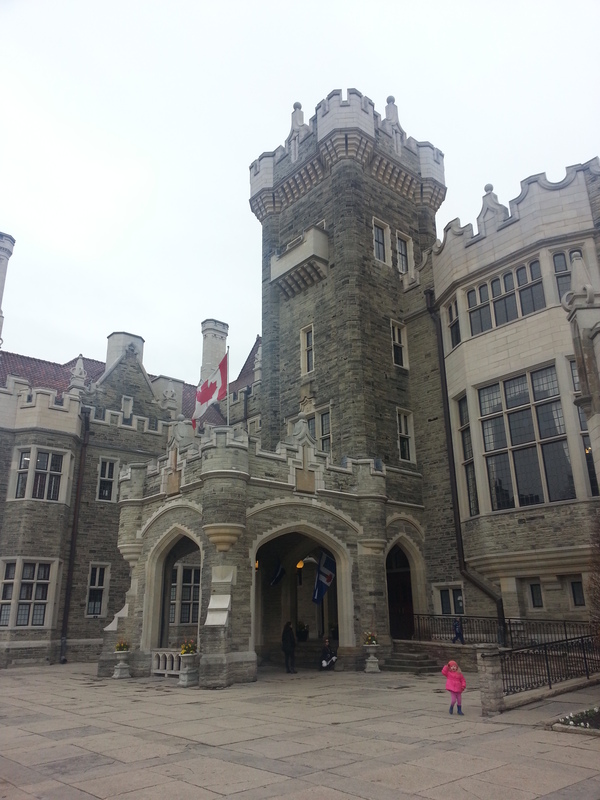 Next, I walk around to Pellatt’s Casa Loma, also a Lennox design (perhaps his most famous? ), completed in 1914. The House on the Hill is a mishmash of styles and thus drives some architecture junkies nuts. Me, I’m mostly indifferent. As I scan it now, it’s definitely imposing, but doesn’t wow or horrify me. The one constant in its history has been it’s uncertain future – the idea of a civic museum inside its walls is one of them. 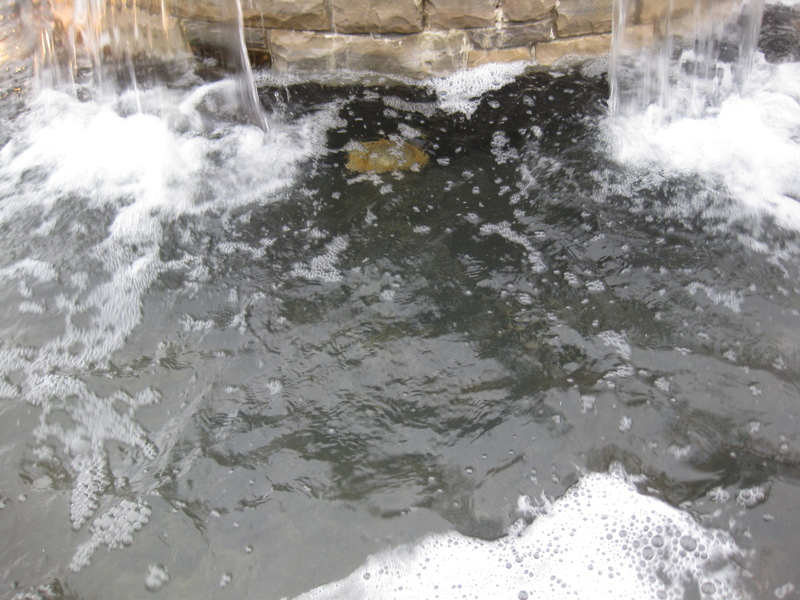 Peering into the fountain, I don’t see any pennies. De-circulation will do that I guess. I also have to smile at the warning sign behind it. The only reason to make a rule is if there have been past examples. 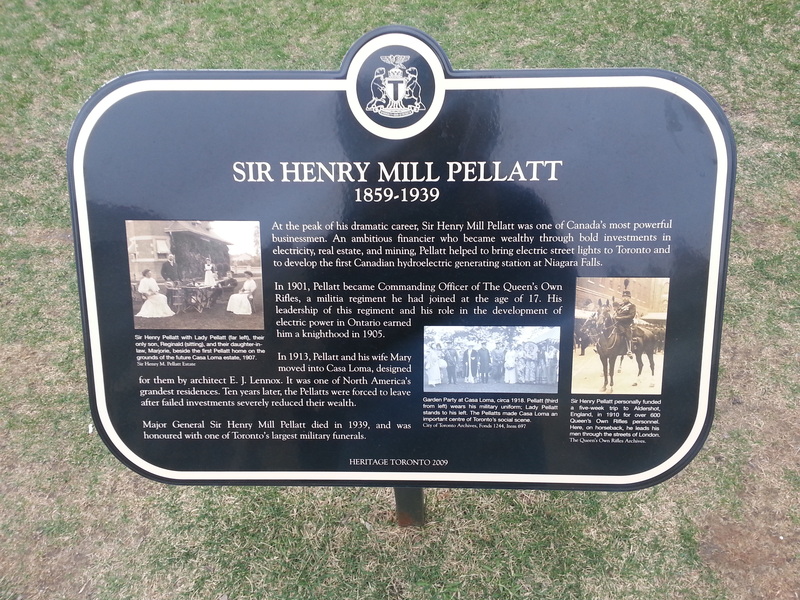 Facing the museum is Pellatt Lodge, 1905, the residence of the Pellatts while the castle was under construction. 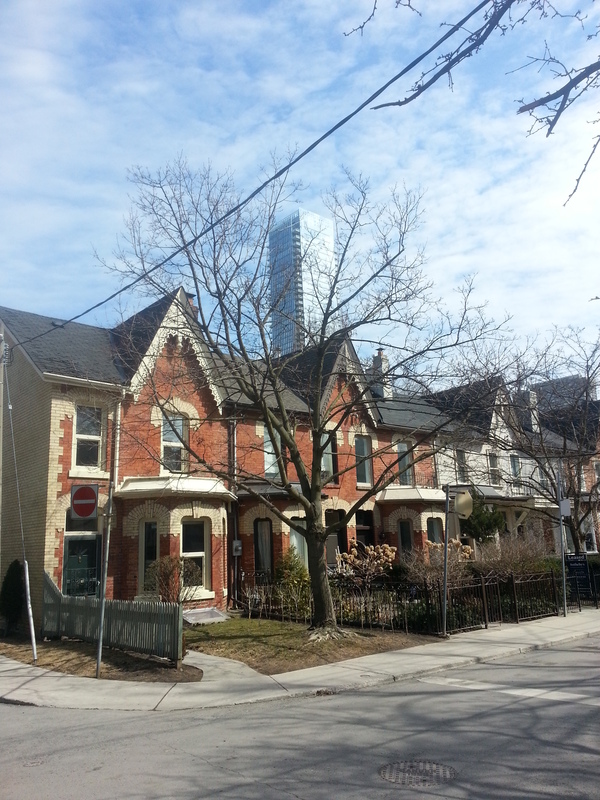 Up the street, I can see another tower rise above the land, and I admittedly have a “Another castle? !” moment. Then I realize these must be the stables – which my childhood does not recall at all but my brain knows a bit about. There’s some reno-ing happening here too. The best tidbit about the stables: SONAR was being developed in its tunnels during World War II. Next, I backtrack on to Austin Terrace and give the street a little promenade. 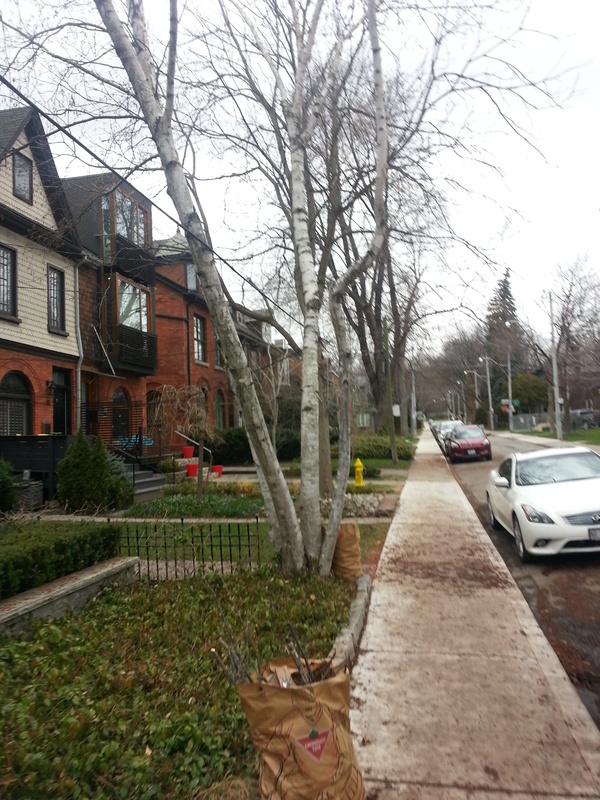 It’s narrow, it’s quiet, it’s treelined – all the checkmarks of a residential street checked off. My stopping point before circling back to the castle is a neat cottage-y house at Austin Court. From there, it’s down the hill on Walmer again where there are mansions overlooking the way. Hello Davenport, old friend. 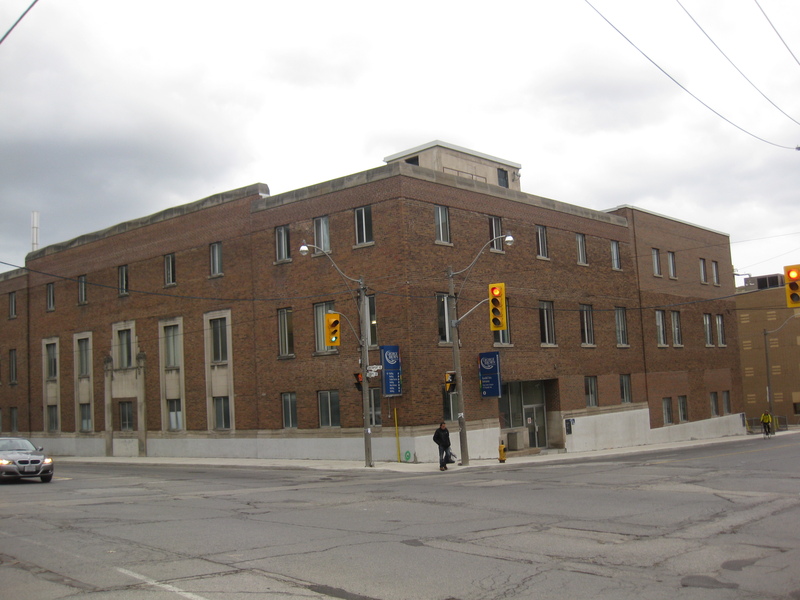 And hello, George Brown College. 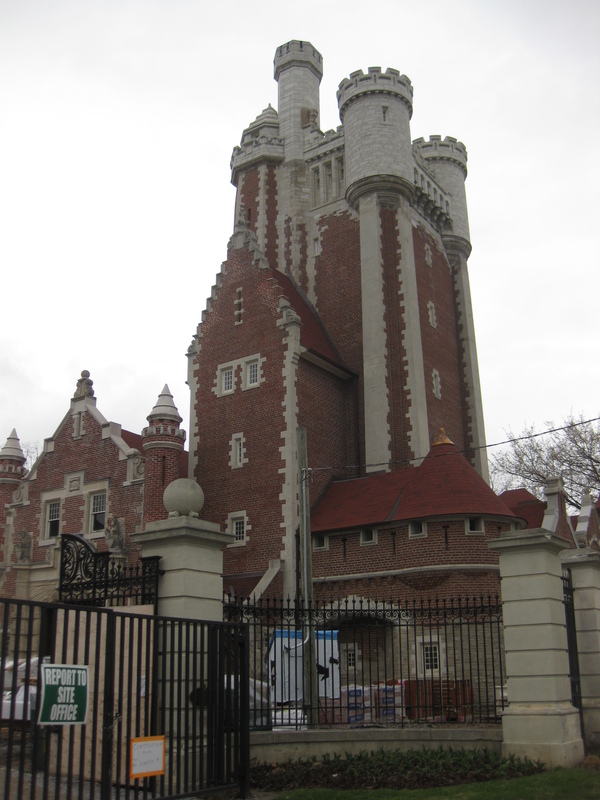 The school’s Casa Loma campus was founded here in the 70s and it definitely looks it. 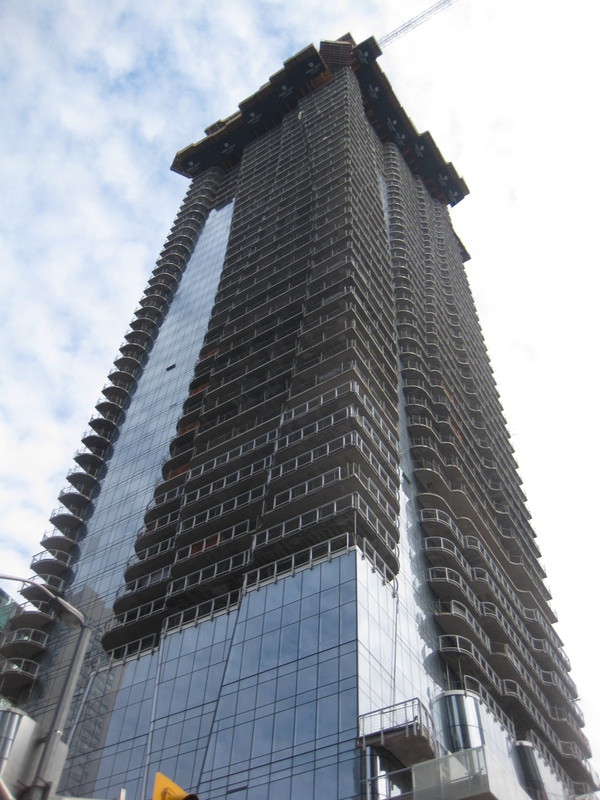 Or at least, the newer buildings do. 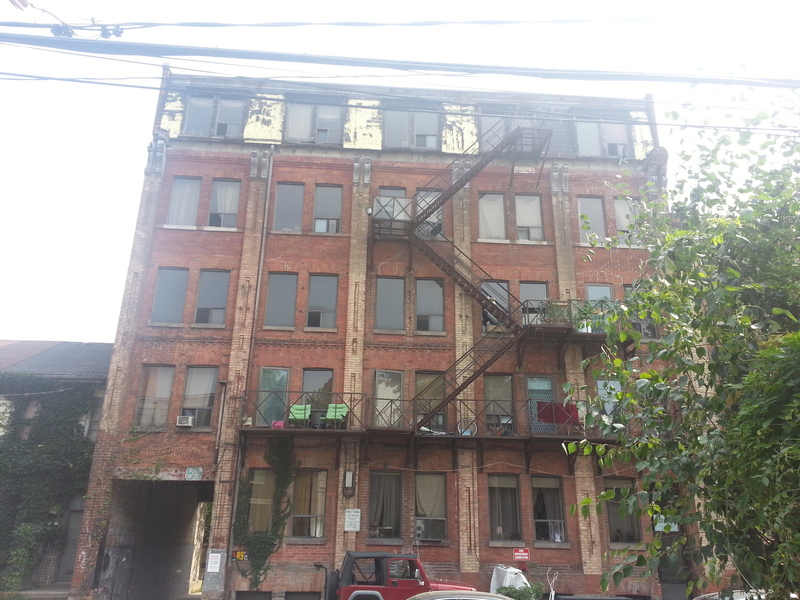 Its older ones are repurposed industrial structures. I get a kick that there’s a Tim Horton’s neighbouring by. Students do need their caffeine after all! 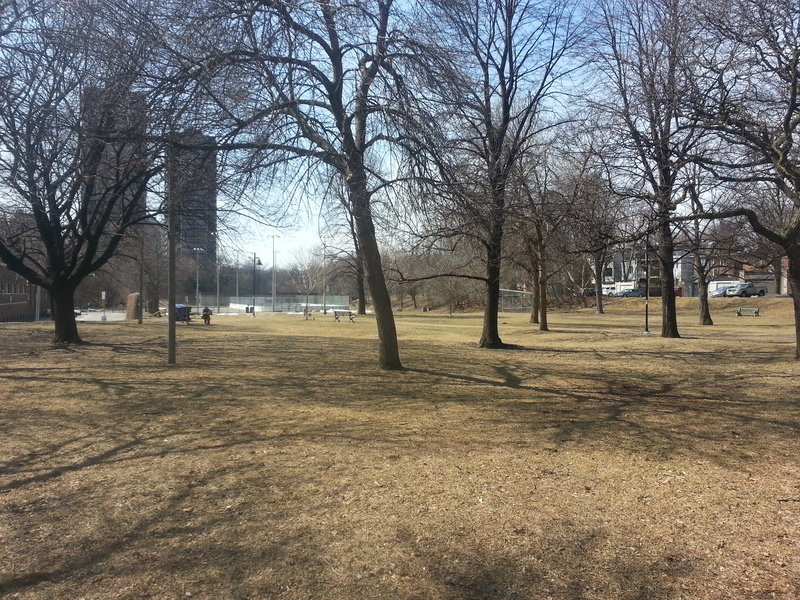 Continuing on, I hit Tollkeeper’s Park. 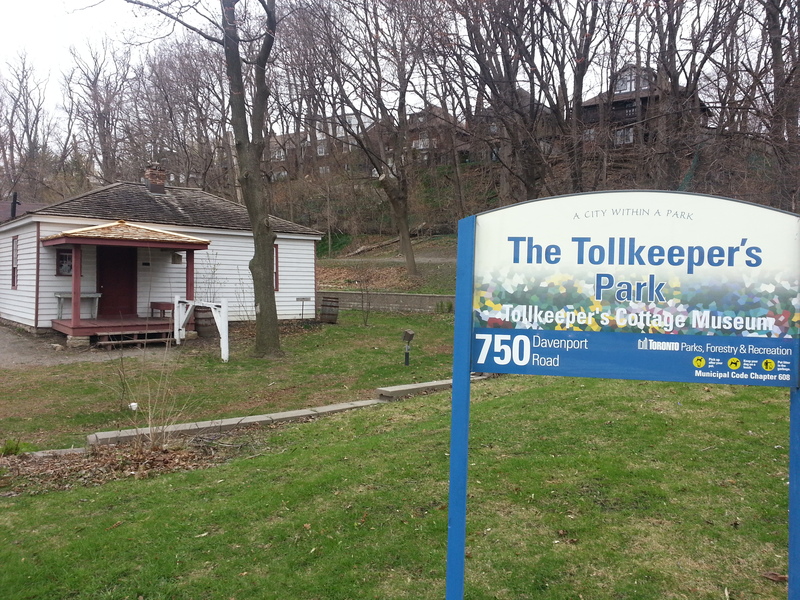 It houses the Tollkeeper’s Cottage, a lesser known museum which throws back to the days of toll roads and the stations that operated them. 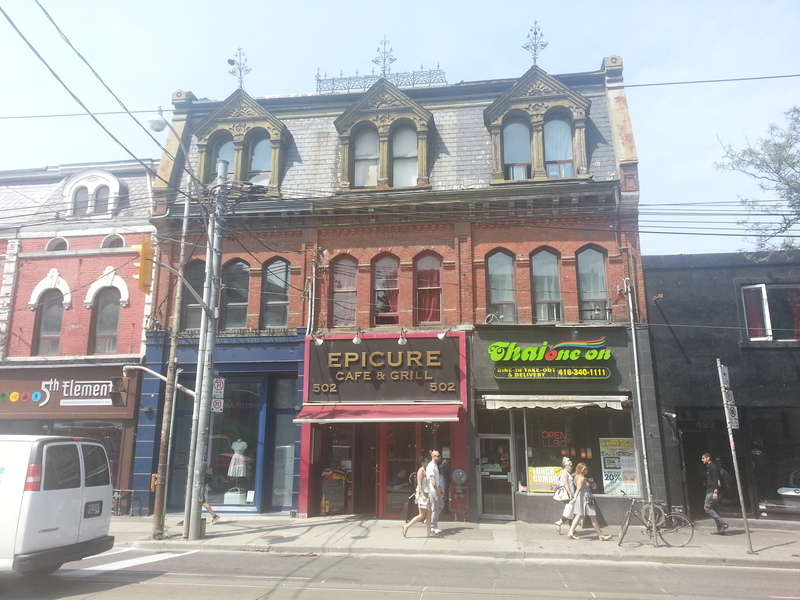 This one at Davenport and Bathurst was in service as early as 1850 and the building itself dates to the 1830s. It’s definitely a great opportunity to tell the story of early York and winding Davenport Road. As I sniff around the site there’s a couple also checking it out. They go right up to it, but I don’t think they get very far because it seems to only be open on Saturdays. 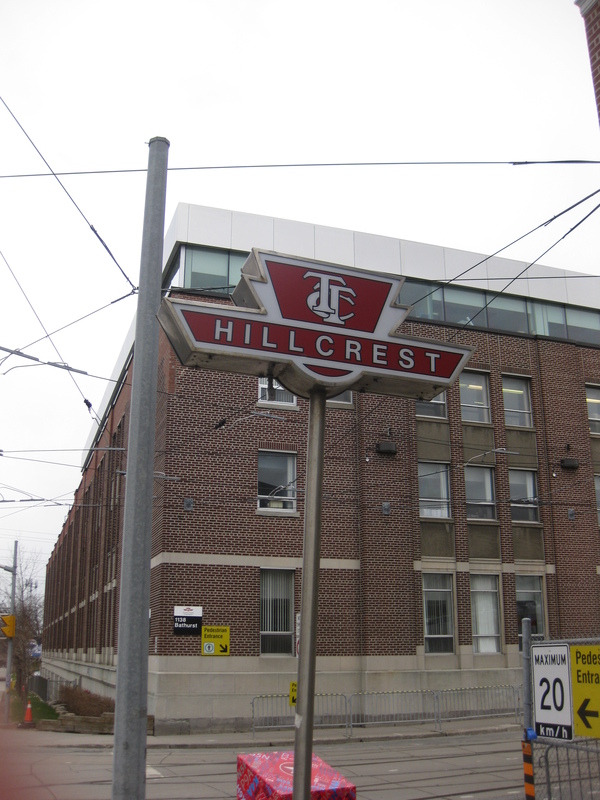 Moving south, the TTC’s Hillcrest facilty hugs the west side of Bathurst and has been on the site since the 1920s. 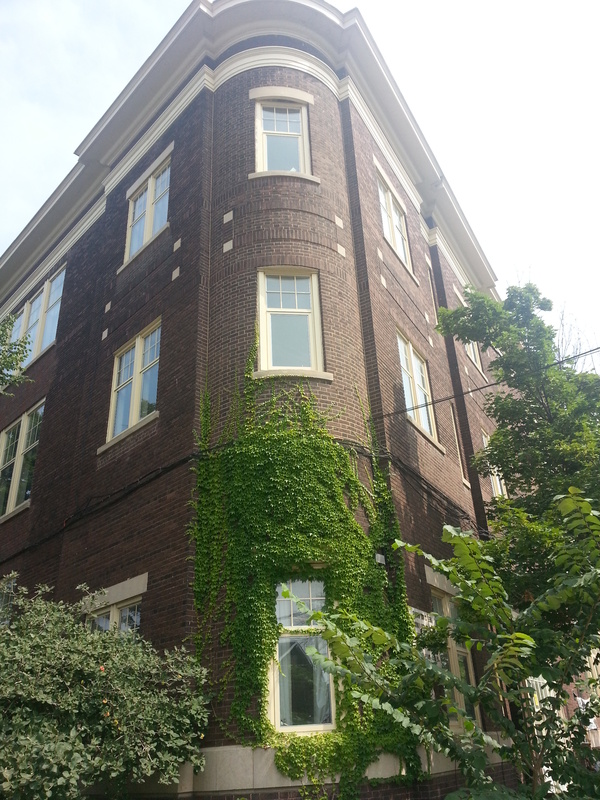 The Inglis building on its southern end catches my attention specifically. Those long arched windows. Finally, the day ends as it began at the tracks. 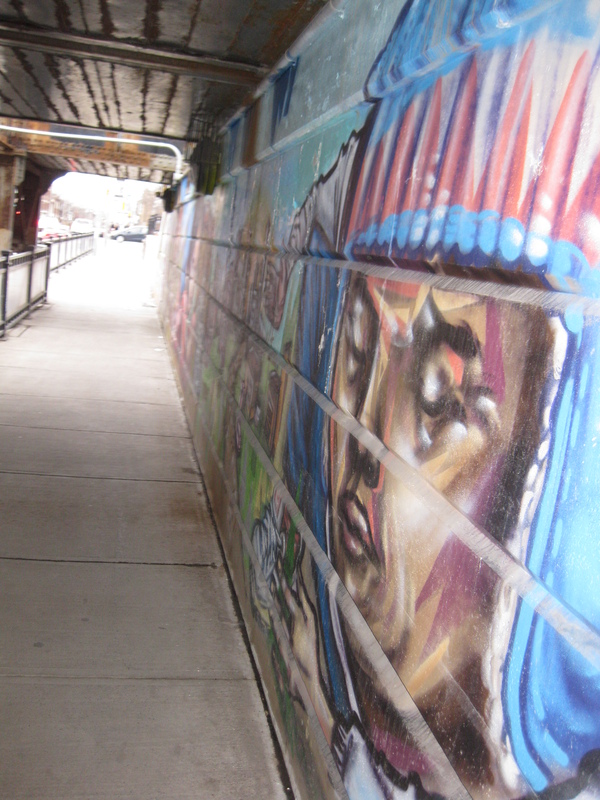 Animated faces greet me at the Bathurst underpass. On the other side, I elect to give my feet a break and catch a streetcar. Note: Adventures as of last fall-ish. 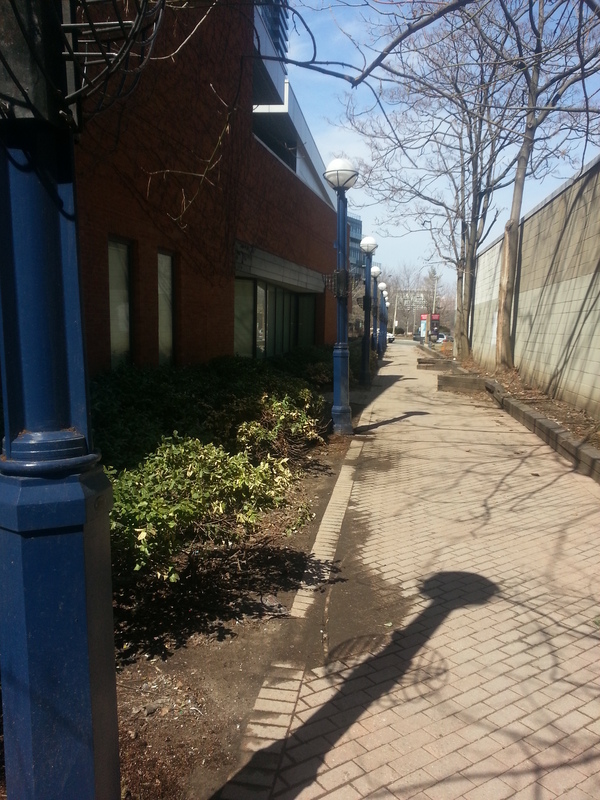 Here’s hoping we get some greenery soon! 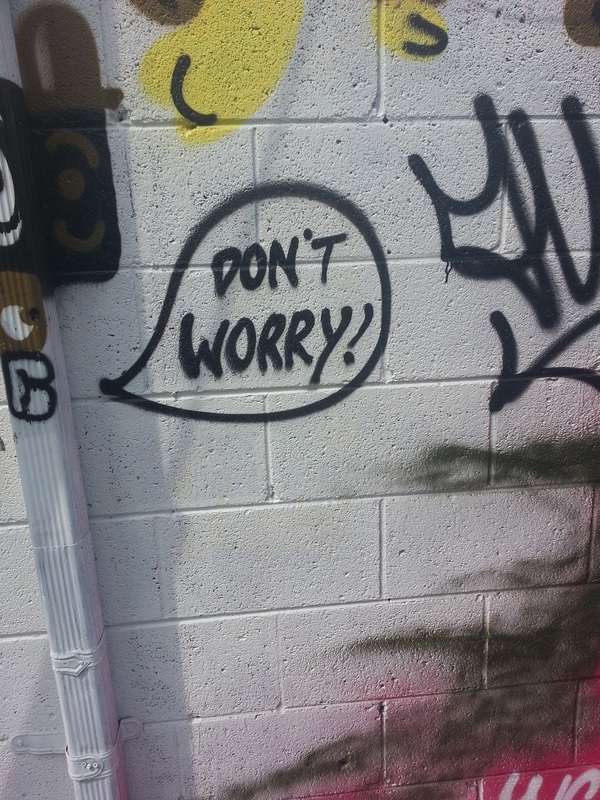 My first impression of Graffiti Alley? 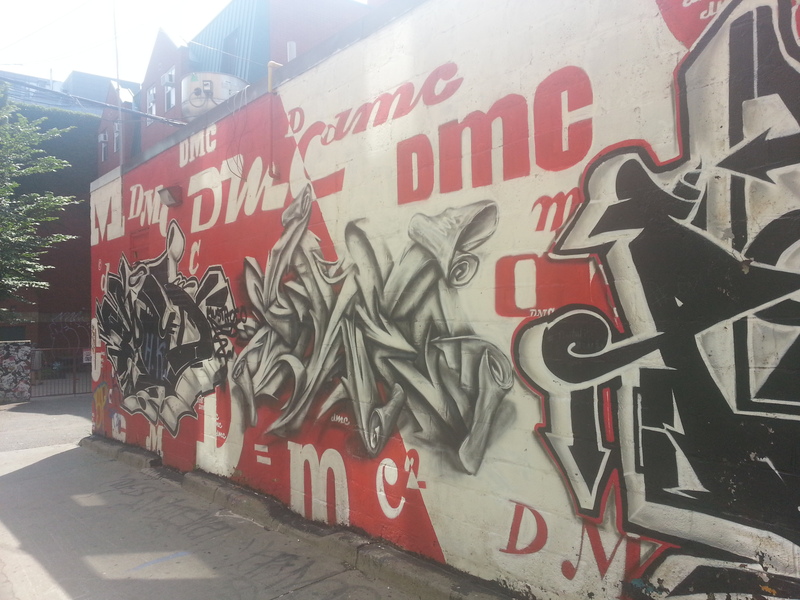 It’s just as much in a hidden corridor and loading zone as it is a gallery. 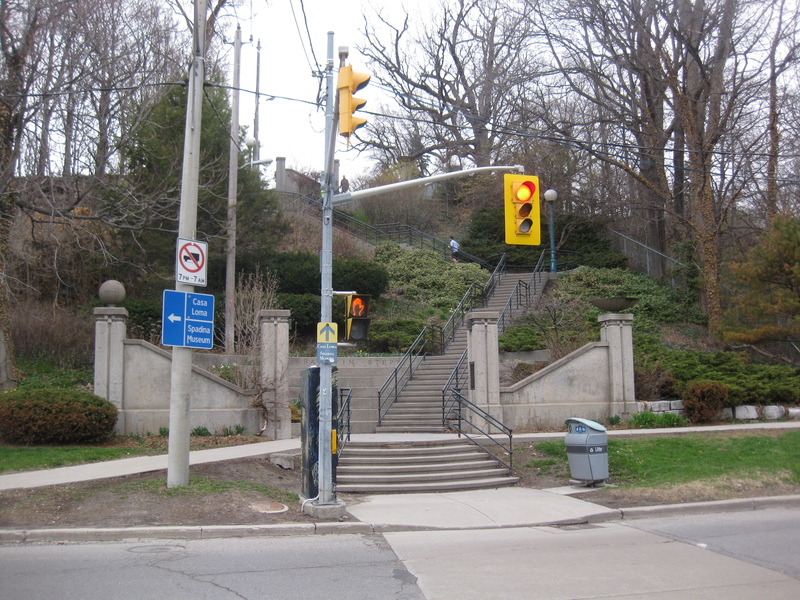 I enter from Augusta, although the path begins at Spadina in the east. The mighty needle rises above some cartoon caricatures dancing around some windows. Nearby, there’s some more sophisticated aquatic renderings. The creative output in both drawings are impressive. It’s a grand exercise in place making, isn’t it? Here you have previously dead, in-between ‘spaces’ turning into destinations themselves through the creative efforts of some talented individuals. As a past adventure taught me, names hold meaning, and assigning a name to a space goes a long way into place making. 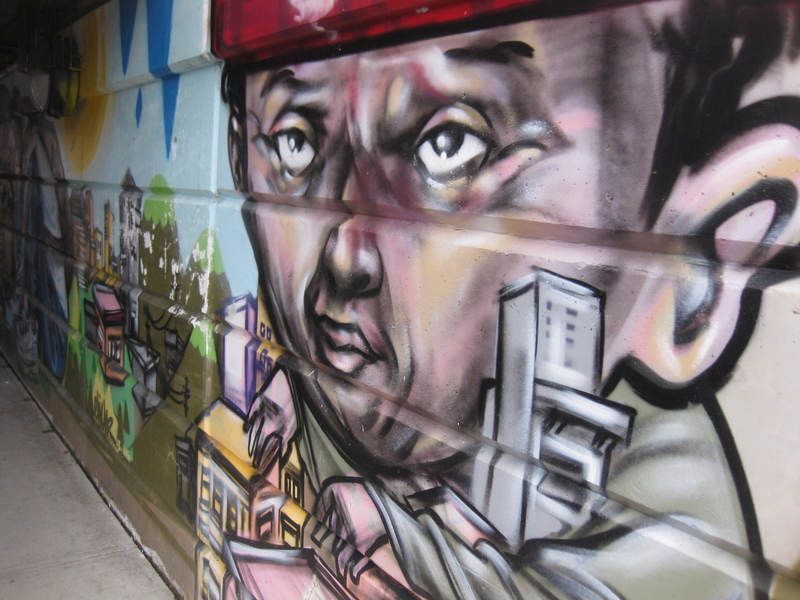 Graffiti Alley is formally recognized as Rush Lane, and doesn’t refer to the trio from Willowdale, but a local who once owned many shops along Queen Street. Making meaning through commemoration. With that knowledge, I come out at Portland and head up to the street. 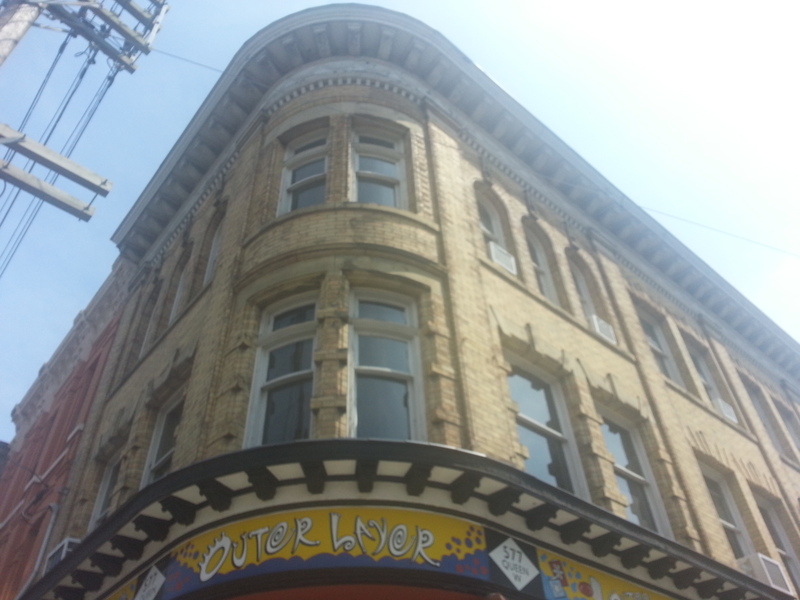 The Outer Layer hugs the corner of Queen and Portland. The rather unfortunately faded plaque can’t tell me this, but this was built as a Bank of Montreal branch in 1899. 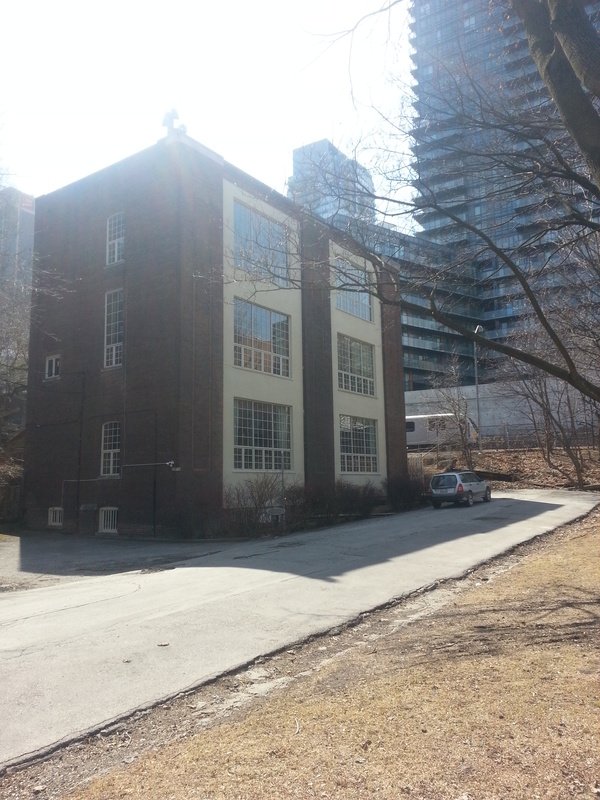 It was designed by Frederick Herbert, who, in my opinion, is the second most iconic architect of old Toronto (E.J. Lennox being the first.) 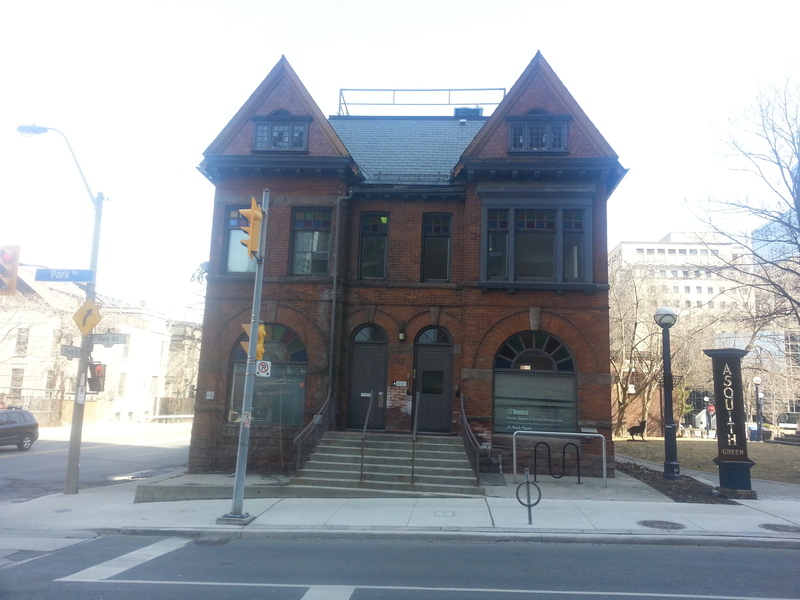 Through observation throughout the city, it doesn’t seem too often that an old bank deviates from its original purpose. Of course, it does happen – the most formidable of Banks of Montreal is now the Hockey Hall of Fame. I do slip inside the shop for a moment. I’m on a mission for some quirky Toronto-themed postcards to send overseas. I don’t find any here, but I do come away with a Lou Reed card and a TTC subway magnet I pick up at the register. Across the way is the formidable looking Epicure Cafe building. I’ve eaten there a few times…very affordable prices for great food. Even further down (not pictured) is Tequila Bookwork, another great local eatery and drinkery. I follow the way past Bathurst, where a backpacker greets me on the other side of the crossing. I’m not sure what kind of works he’s packing. Outside the Dog’s Bullocks (possibly the greatest name for a bar), a group begins a chant that I don’t get but they find wildly amusing. 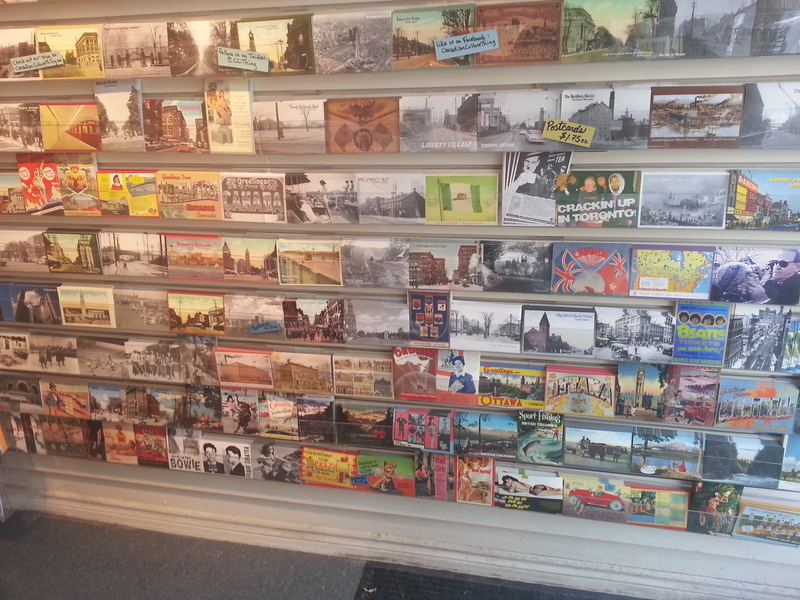 A few doors down is Valhalla Cards, which houses a grand collection of postcards. 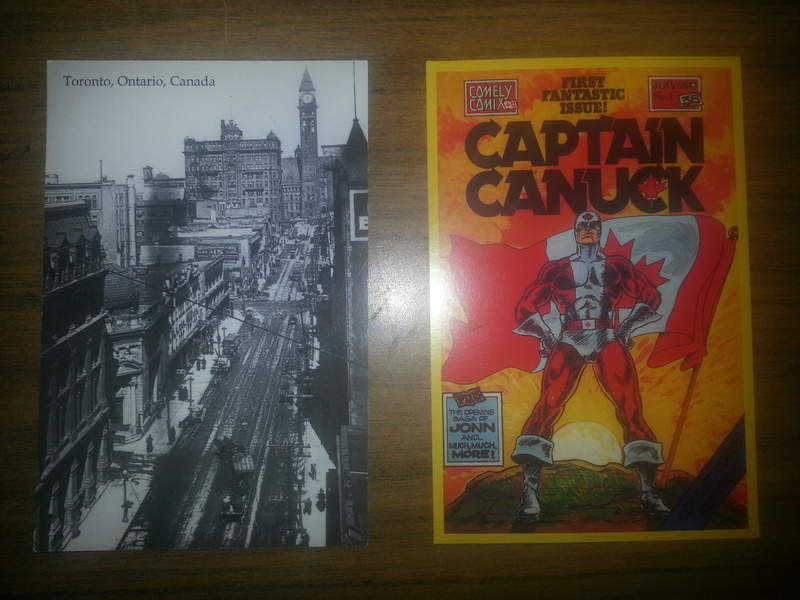 Among my purchases are a 1910 look up Bay Street and a Captain Canuck cover from 1975. 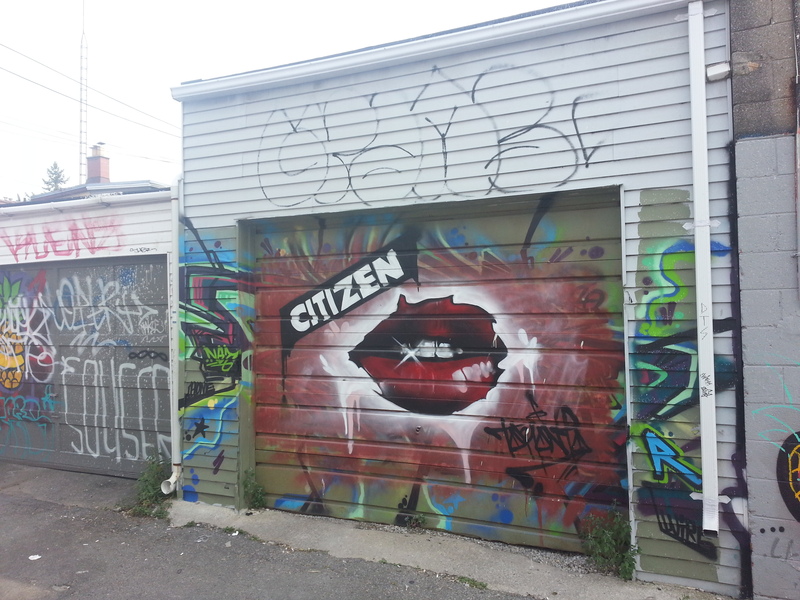 Next, I take a swing onto Niagara Street, and another alley quickly greets me. Unlike Rush Lane, this one is unnamed – but this is expected. 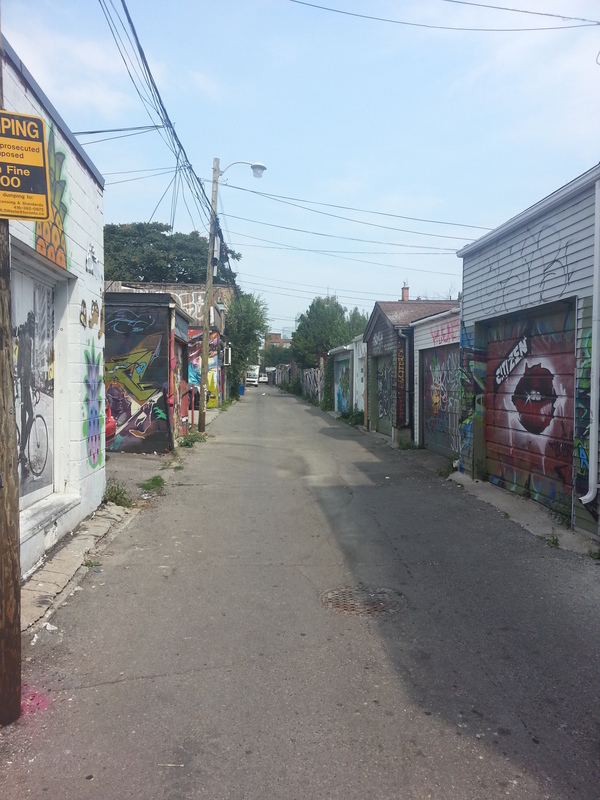 Of the 3000+ alleys in Toronto, only 200 are actually places. 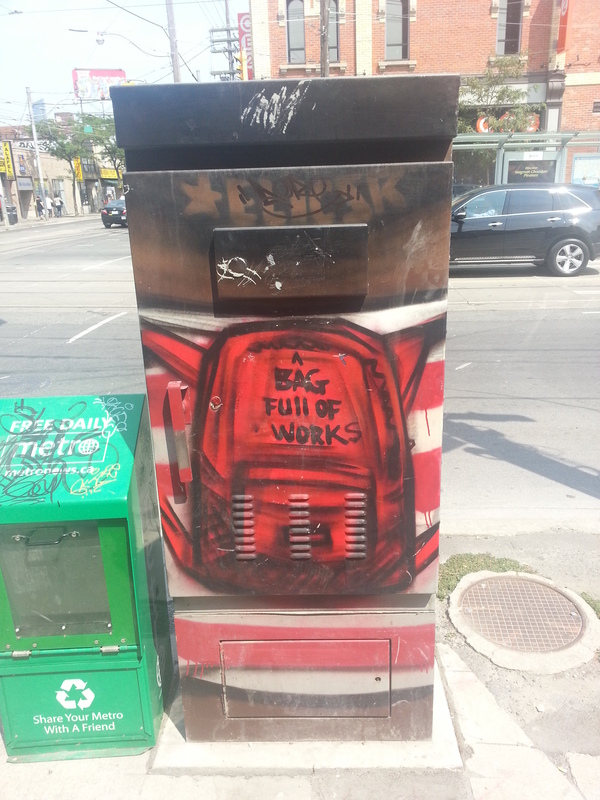 One such exists north of Gerrard between Coxwell and Greenwood. 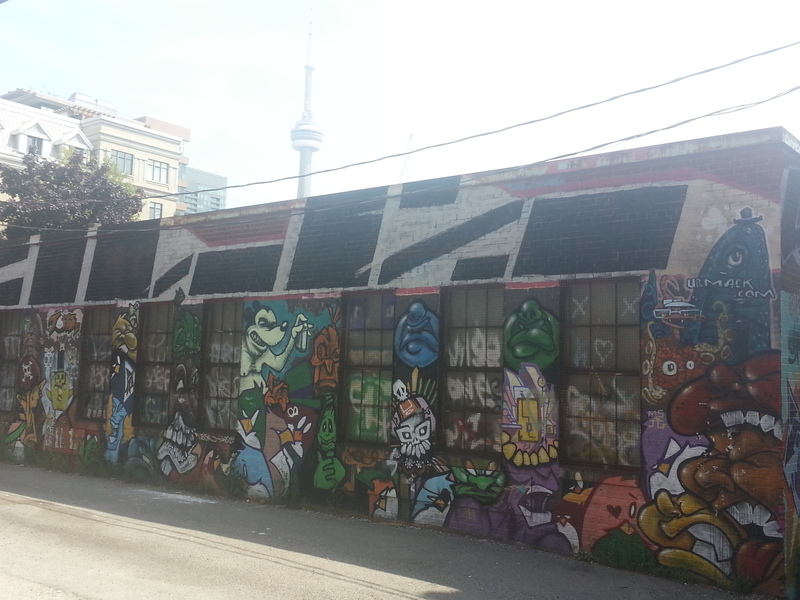 Here I encounter a cyclist and the CN Tower again – albeit anthropomorphized. I love TO too, little needle. I also get some two-word advice. For an existential thought, I mentally tag on ‘Yourself’ to this one. 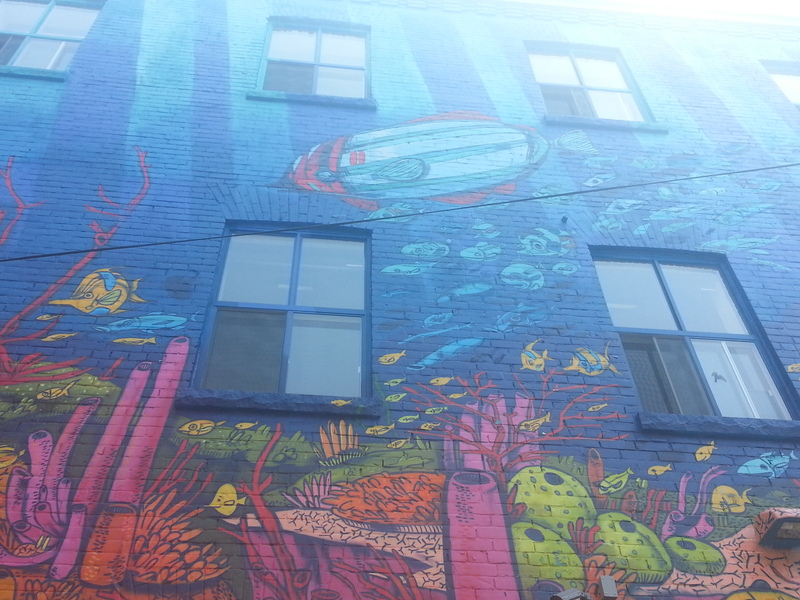 Back on Niagara, another sweet mural presents itself. 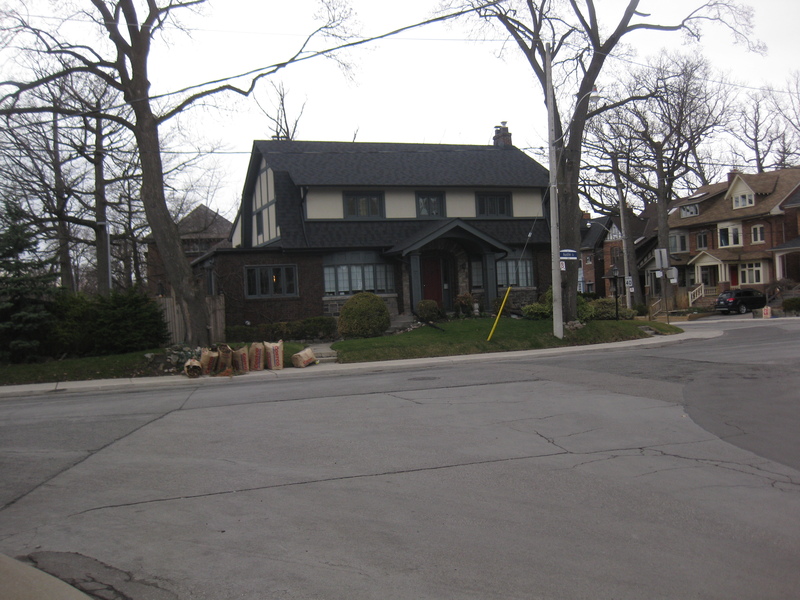 Whenever I used to see Niagara Street on a map, I’d always wondered why it curved. 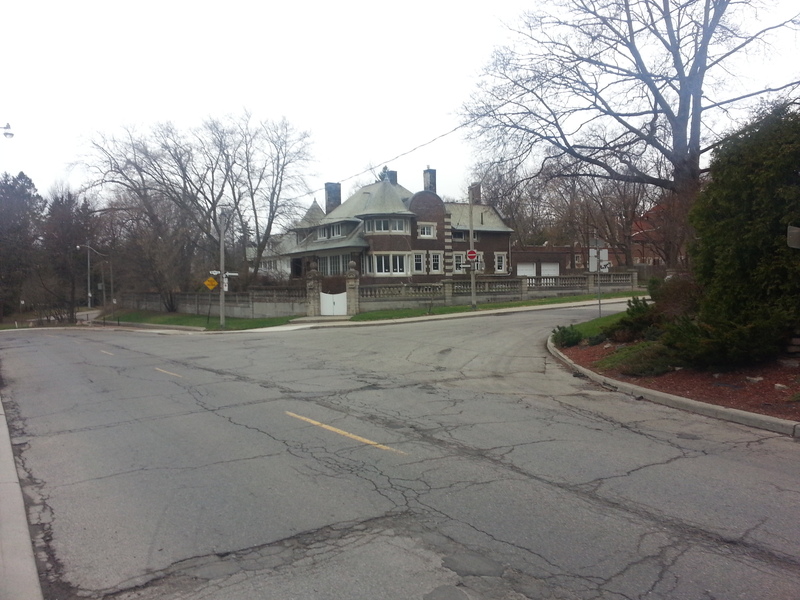 All the streets around it follow a grid; what is Niagara’s deal? Did the town planners have a fun day at the office that day? Only recently did I come to the realization that’s all geography. The now buried Garrison Greek ran roughly parallel to the street. 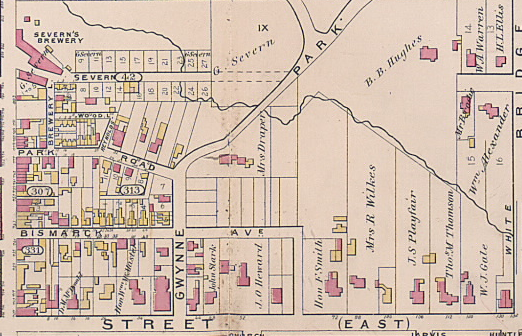 In fact the western side of Niagara used to have breweries and lumber yards, which lined the banks of the creek. 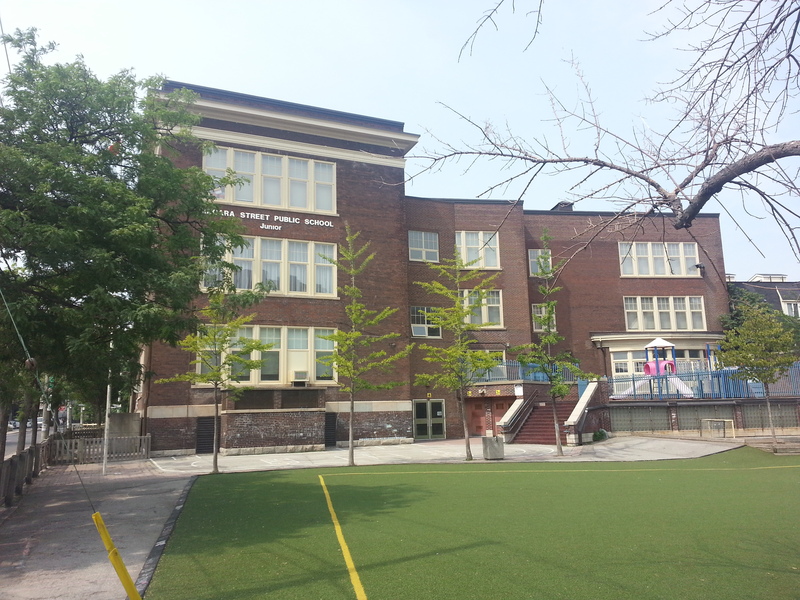 Down the way I find Niagara Street Junior Public School, which celebrates its centennial this year. It’s actually the second incarnation of the school, the first built in 1874 and later demolished to make way for the new building. Maybe it’s my suburban upbringing, but the yard is curiously small for a schoolyard to me. The grass is not actually grass either. 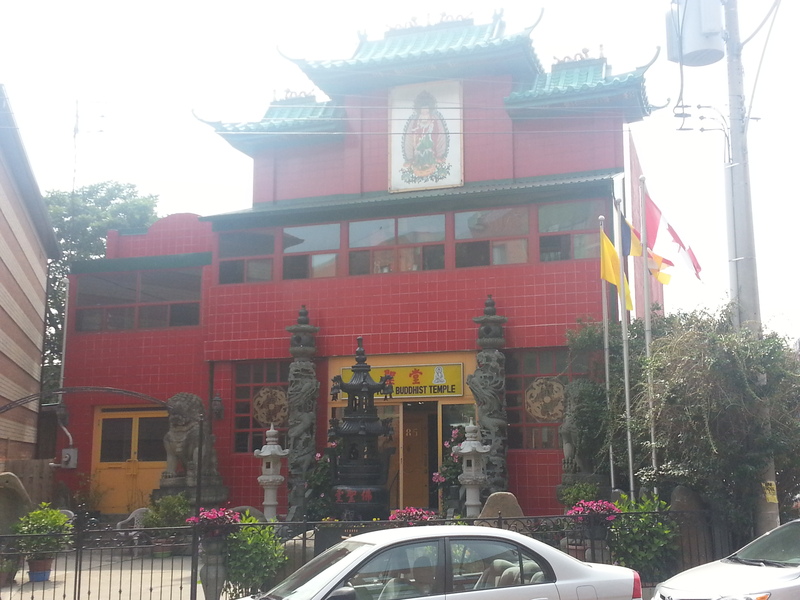 Further down past King Street I find the another institution, the Fu Sien Tong Buddhist Temple. It looks odd to me – not the building itself, because that’s beautiful and an unexpected discovery – but the way it’s set back from the street and not parallel to it. 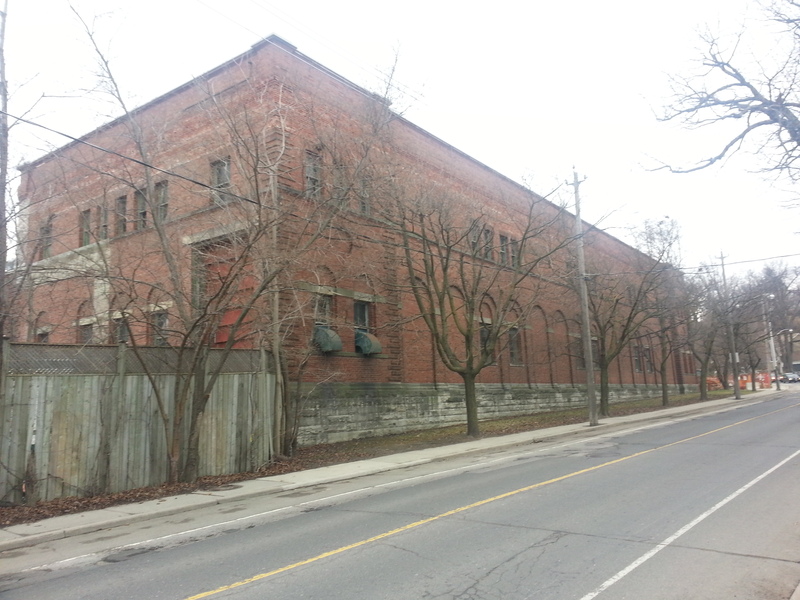 Where Niagara meets Tecumseth is some more industrial history in the former National Casket Co. buildings. 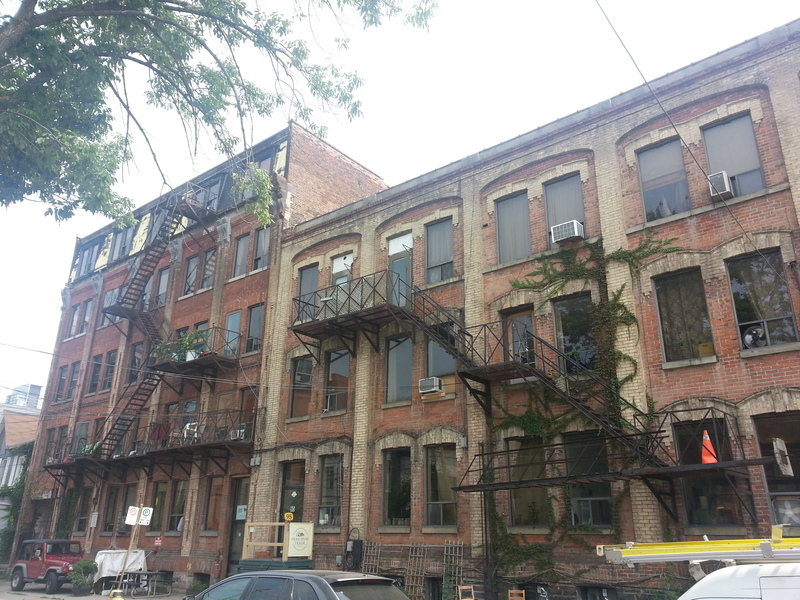 It’s a complex of three structures built between 1884 & 1887. The most easterly is the oldest. You can guess that they’re about to undergo development. 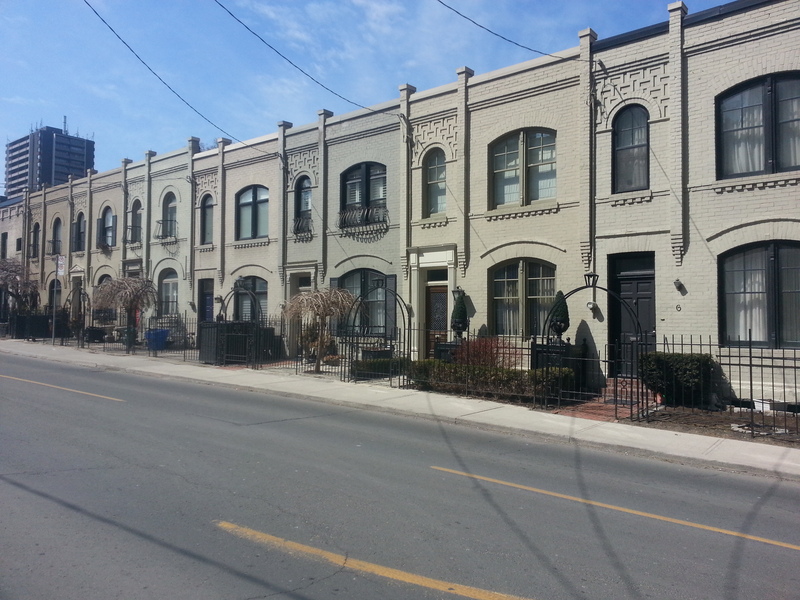 That’s not the extent of the industrial character of the street. 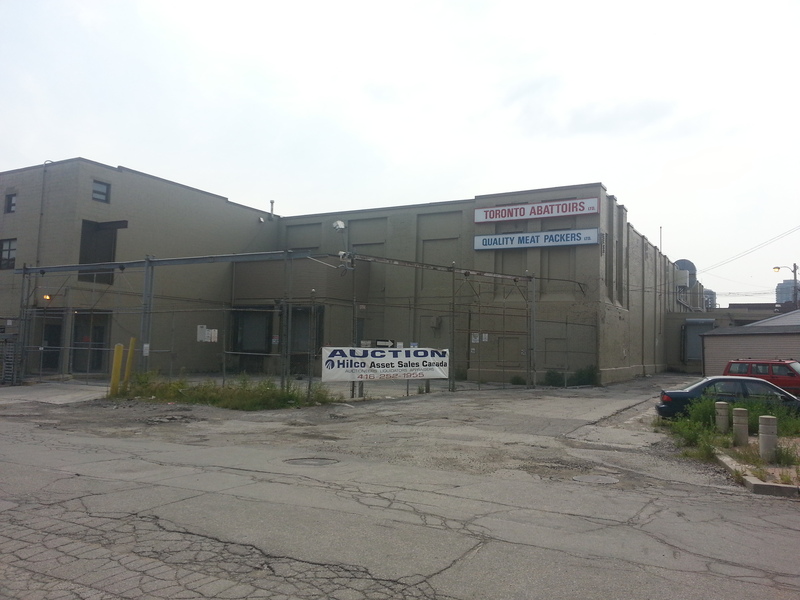 At the very foot of Tecumseth is the Toronto Abattoir. Or was, anyway. This year marks the end of a 100+ year history of animal processing in the area. 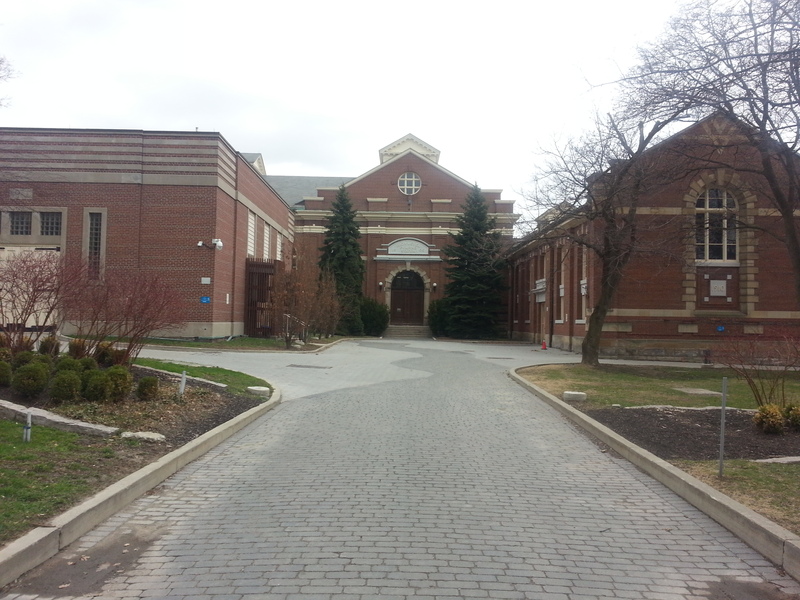 To think: an animal slaughterhouse and a coffin factory steps from each other…kind of dark, no? Goads Map, 1924 – Toronto Abattoir & National Casket Co. I can’t tell for sure, but I think there’s a remnant of the radial spur below me. I could be wrong. Beyond the railway lands below is Fort York National Historic Site, although I can’t see it right now. 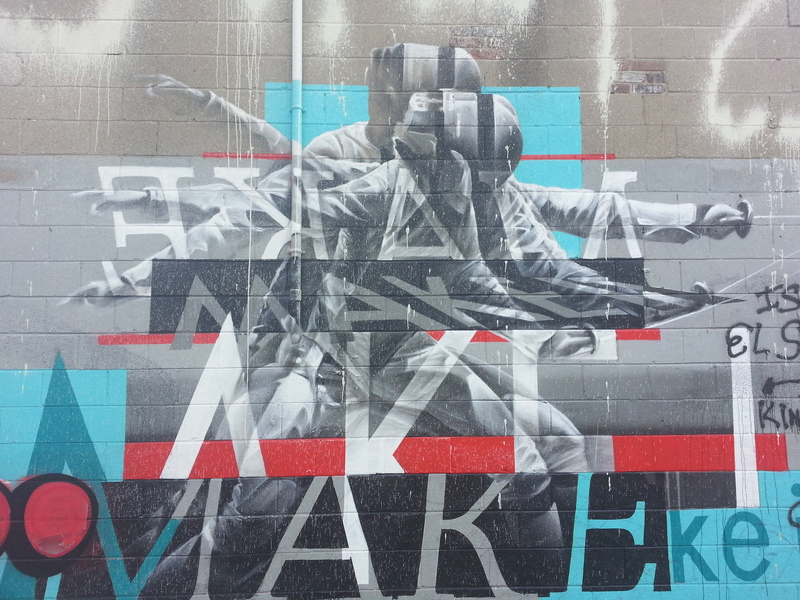 With that, I turn back up the street, spotting the last bit of street art of the day. 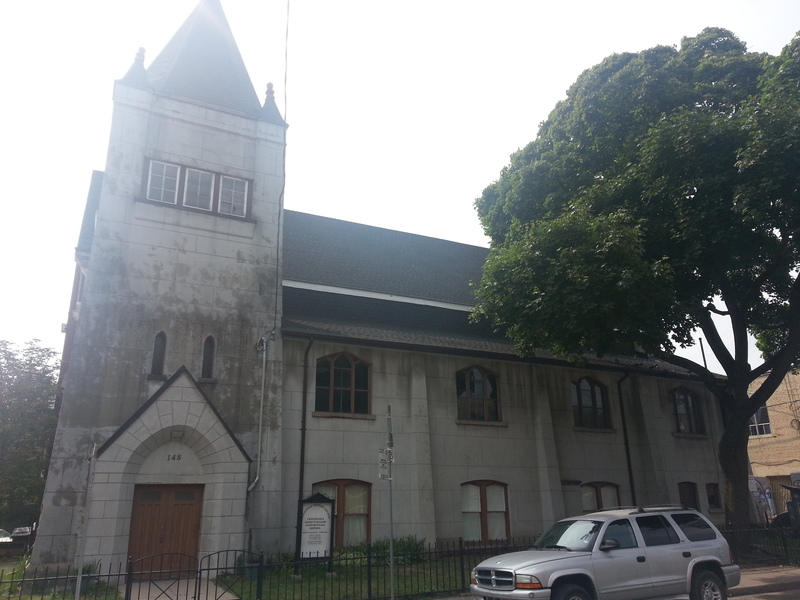 The walk up Tecumseth is rather uneventful – not much happening other than the 1897 Ukrainian Baptist Church near Queen. 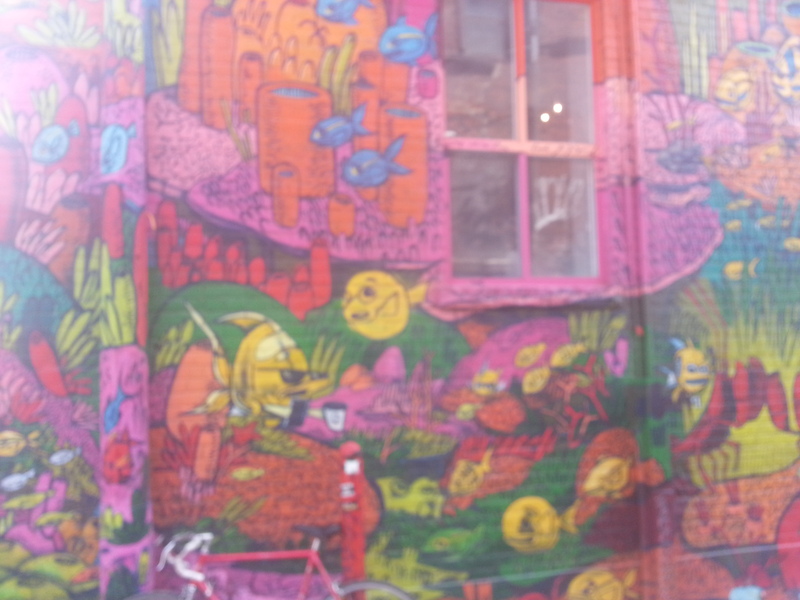 I snap a picture and then continue on to catch a streetcar. Before I can start my stroll, I note the taste for coffee developing in my buds. I opt not for Starbucks and not for Timmies, which hang beside each other in competition, but for the Toronto Reference Library. Yes, it may be closed on this Easter Monday, but Balzac’s isn’t. The customer in front of me in line tries to pronounce the name of the brew she’s ordering; the barista has to correct her. Me, I don’t bother with the given name of my amber roast; I grab it and am on my way. Now I can start. 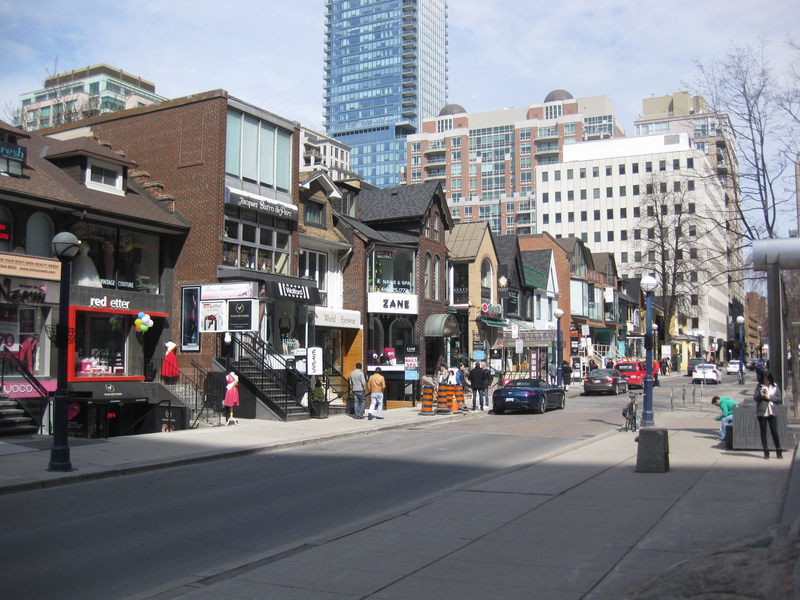 Yorkville is about as quintessential a Toronto neighbourhood as you can get. It also has a deeply layered past and an ever evolving future, some of which I am already aware of and eager to see the evidence of. While its borders have expanded and contracted over its long history, it’s my thought that the part east of Yonge doesn’t get a lot of consideration. And so, that’s what I intend to do to start things off. I don’t get very far on Asquith before I see my first discovery. 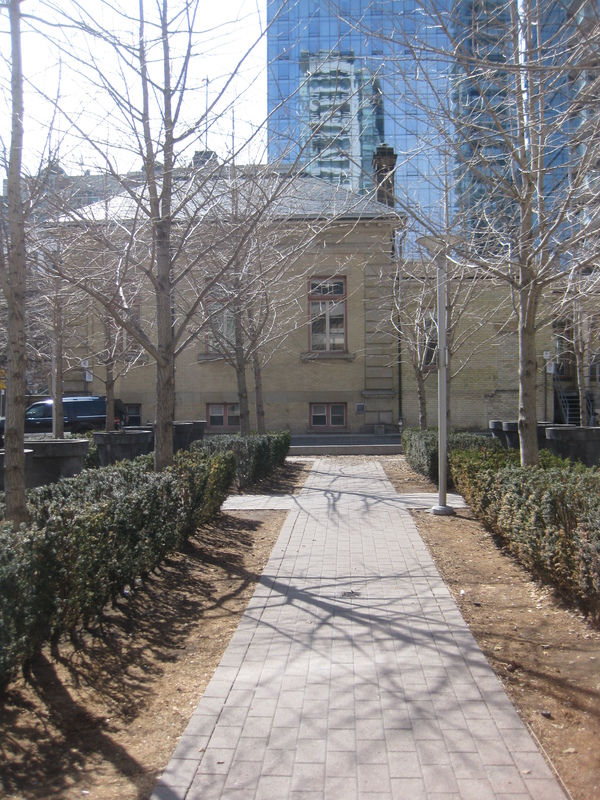 Although I’m hugging (not literally) the Bell building on the opposite side of the street, my eyes spot a pathway beyond the library across the way. The street sign reads ‘Sherlock Holmes Walk’. Literary giants next to one another! Having read Mr. Conan Doyle’s biography years ago, I imagine he would approve of the tribute – he loved Toronto and Canada (and hated the States). 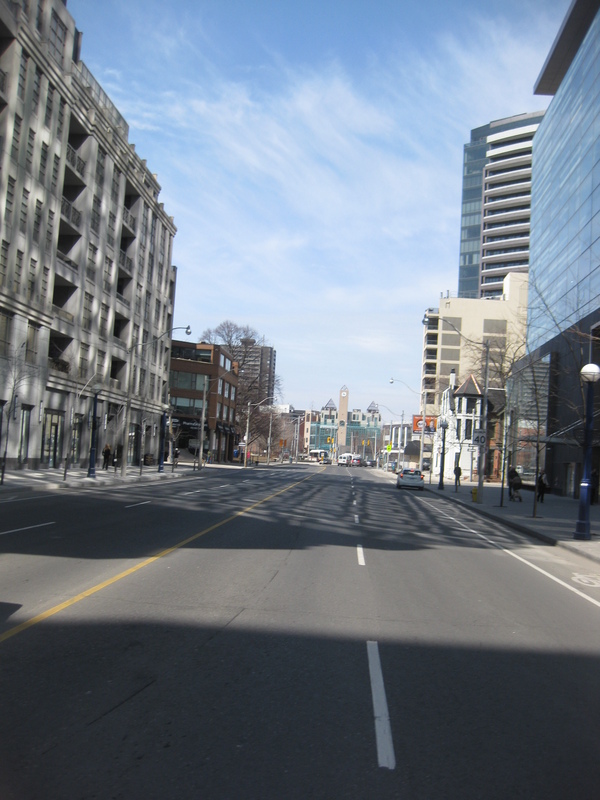 At the end of the way is Church Street, whose curvy route between Bloor and Yonge Streets is the result of a project to relieve traffic congestion in the 1920s. Even without this knowledge, the odd meeting of Church, Collier, and Park streets and the island it forms in the middle just looks unnatural. I look towards Davenport, spotting the famed Masonic Temple, 1917, but opt to head in the opposite direction. 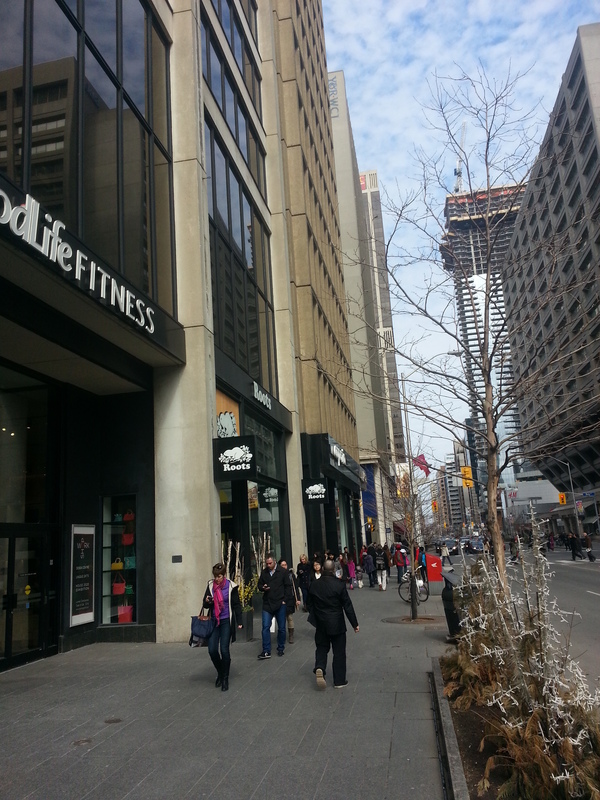 Yorkville, east of Yonge Street. Source: Goads Atlas, 1884. My next stop, situated beside a singular Victorian house (no doubt once part of a row), is Asquith Green, which sadly is more muggy brown than green. Still though, I remind myself of the parkette’s potential in the summer and give it points for the animal cutouts and accenting structure in the middle. I don’t know the source of what I think is a quote, but subsequent Googling has produced ‘We Rise Again’, an Eastern Canadian music classic. Here’s a moving version with the great Maritme songstresses, Anne Murray and the late Rita MacNeil. Following Park Road up, I come to Rosedale Valley Road. 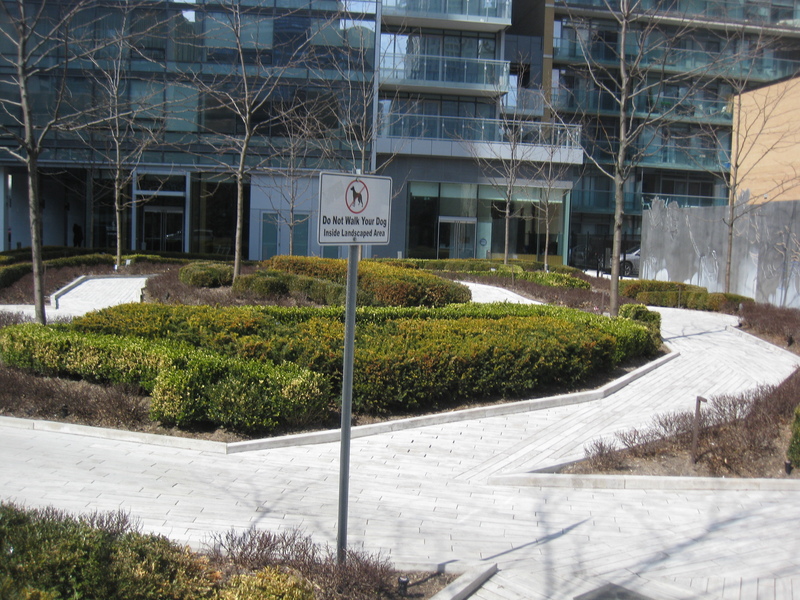 This quiet throughway marks the border between Yorkville and its upscale residential sister, Rosedale. It is also built on top of the now completely buried Castle Frank Brook. 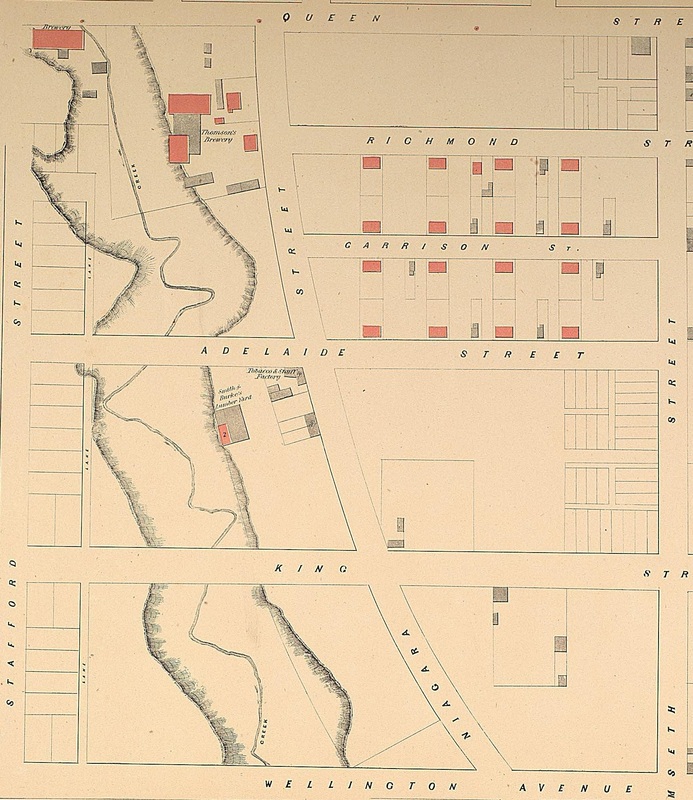 It is particularly important in shaping the modern geography of Yorkville, but also to its history – particularly in its brewing and brick making past. 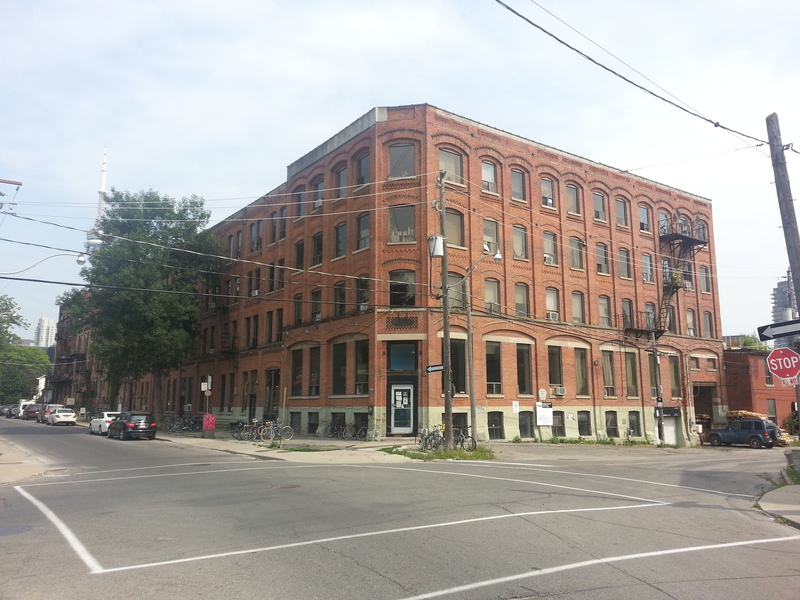 Located southwest of me near Sherbourne Street, for example, was Joseph Bloore’s brewery. Bloor Street, of course, is his namesake. 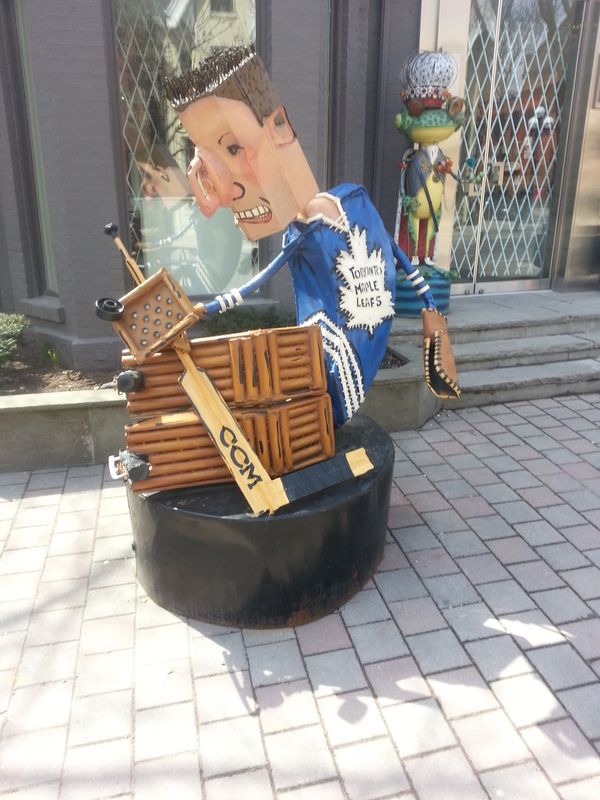 (Mr. Bloore also holds the distinction of having the freakiest portrait of any figure in Toronto’s history.) 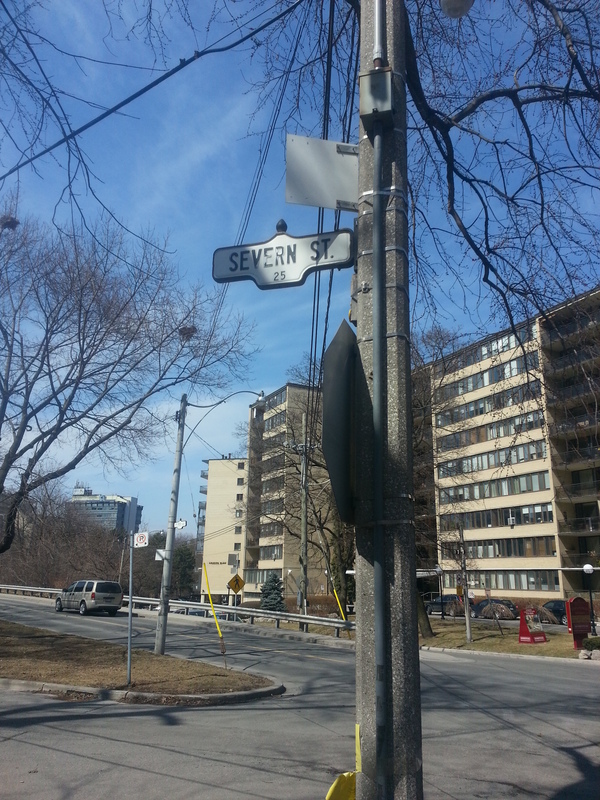 Parkland marks the intersection, and trudge through it to arrive at Severn Street. 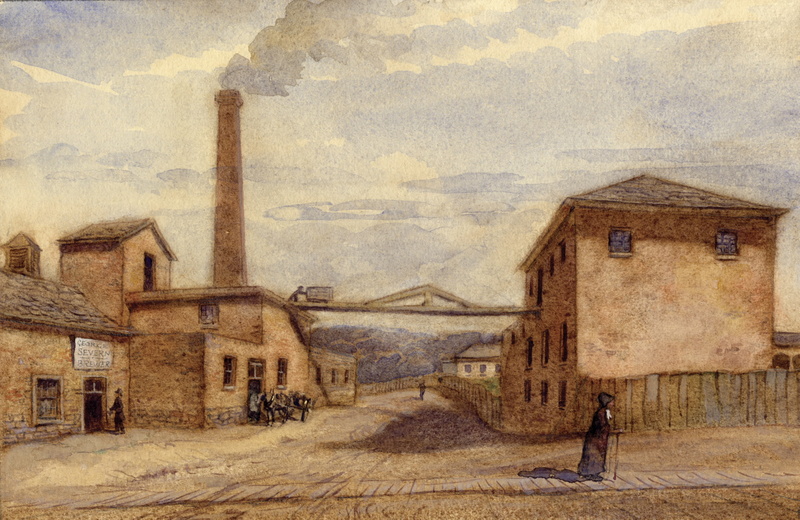 Joseph Bloor Brewery, 1865. 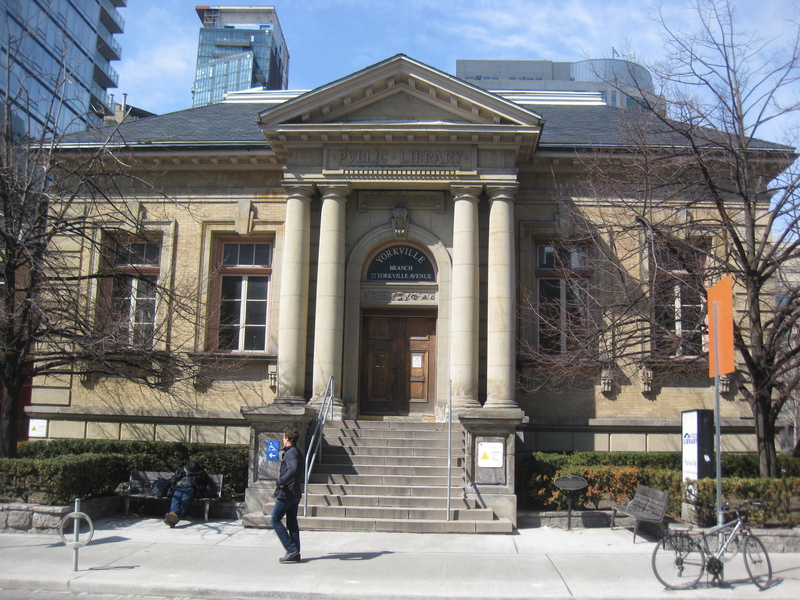 Source: Toronto Public Library. The tiny dead end street is anything but inconsequential. For one, it’s named after John Severn, another 19th century brewer. 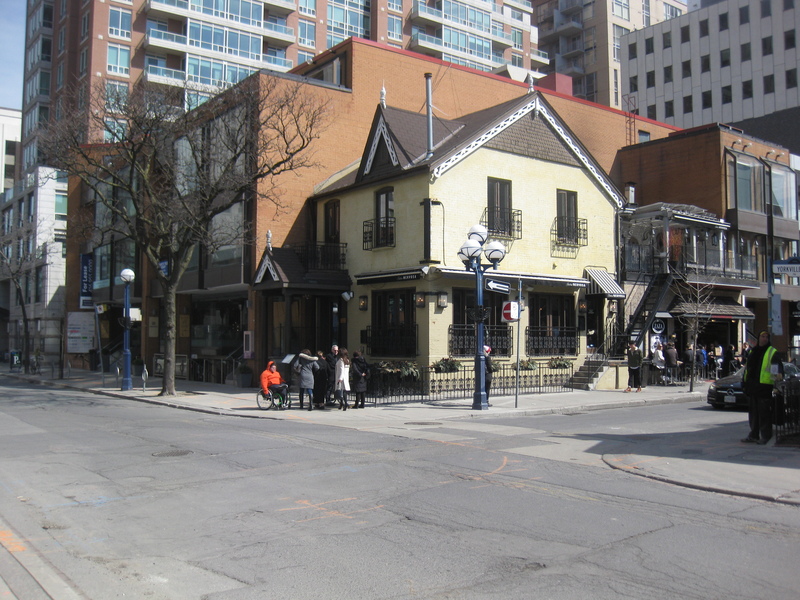 His establishment stood at Yonge and Church. Moreover, Castle Frank Brook’s alternate name is Severn/Brewery Creek. 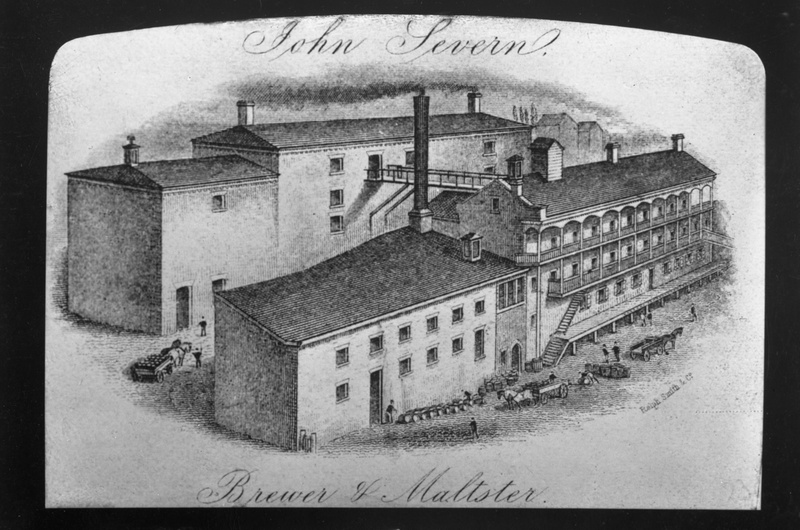 Severn’s Brewery, 1870s. Source: Toronto Public Library. Severn’s Brewery, 1912. 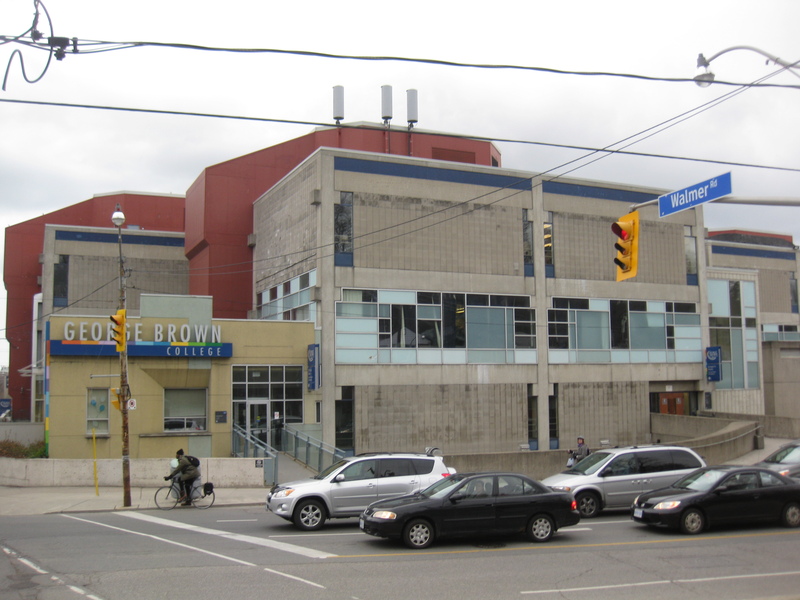 Source: Toronto Public Library. Perhaps even more notable to the street is that one can find the Studio Building. 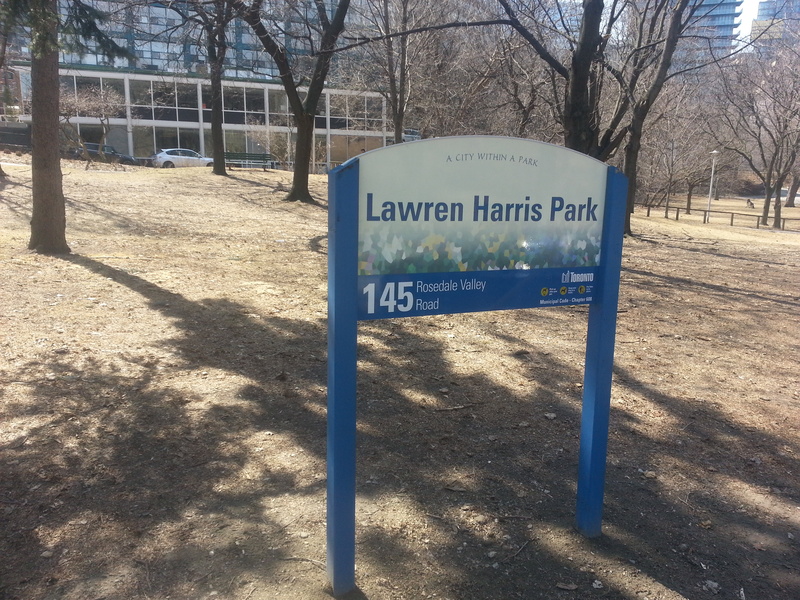 On the way here, I passed through Lawren Harris Park; Mr. Harris lived and worked in the Studio Building, 1914, along with other members of the Group of Seven. 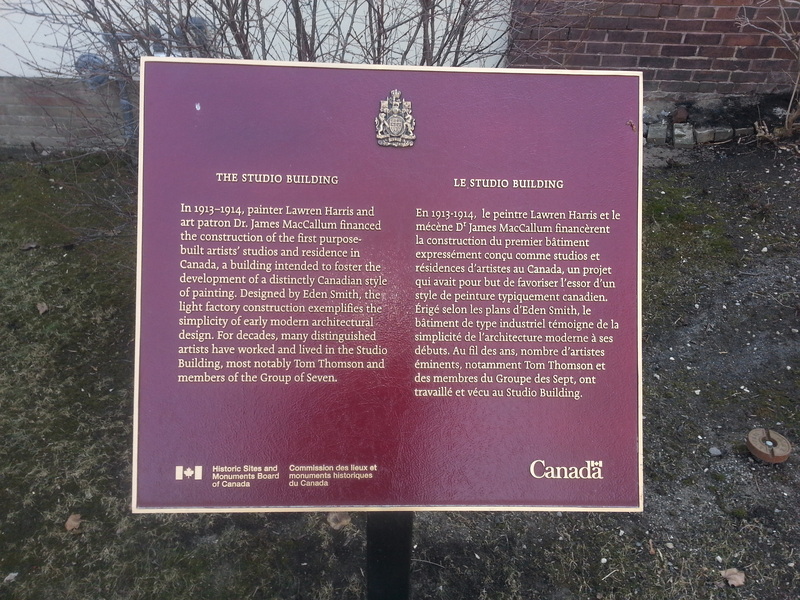 The Studio Building holds double distinction as a National Historic Site and a Toronto heritage property. 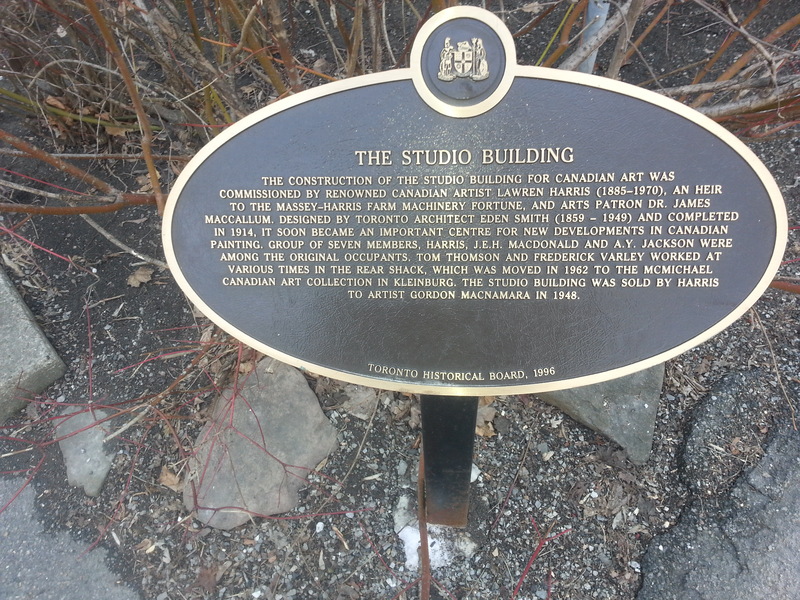 The Toronto Historical Board plaque in particular informs me that the Harris in Lawren Harris is of the Massey-Harris industrial empire. Learn something everyday. 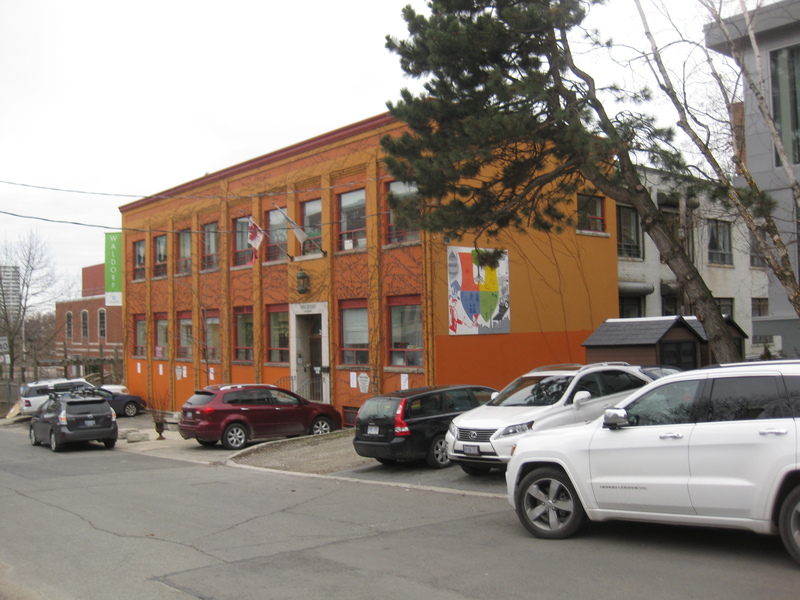 The Studio Building was designed to be a secluded quiet spot where artists can work their creative process. 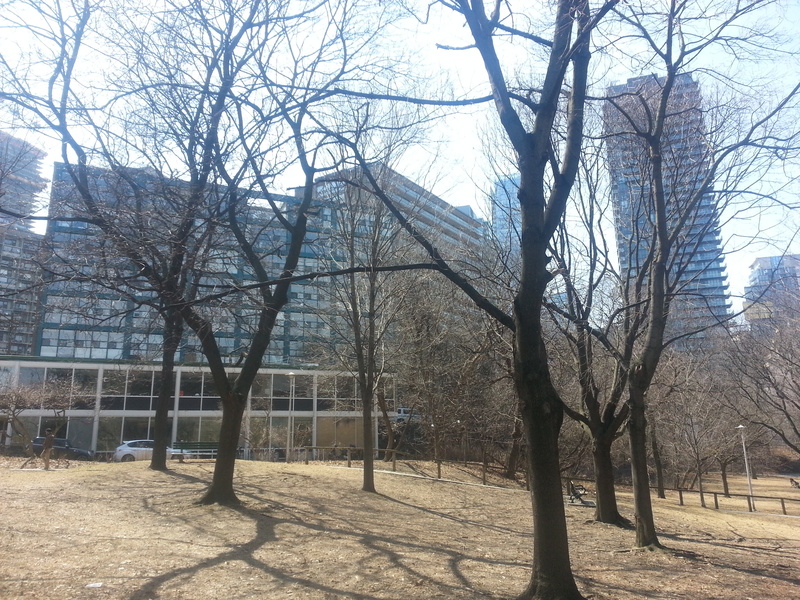 As I move around the building I hear the periodic screeching of the Yonge subway and somehow I think that doesn’t completely hold true today (although the surrounding parkland does help a bit). I continue on my way, this time following Aylmer up. 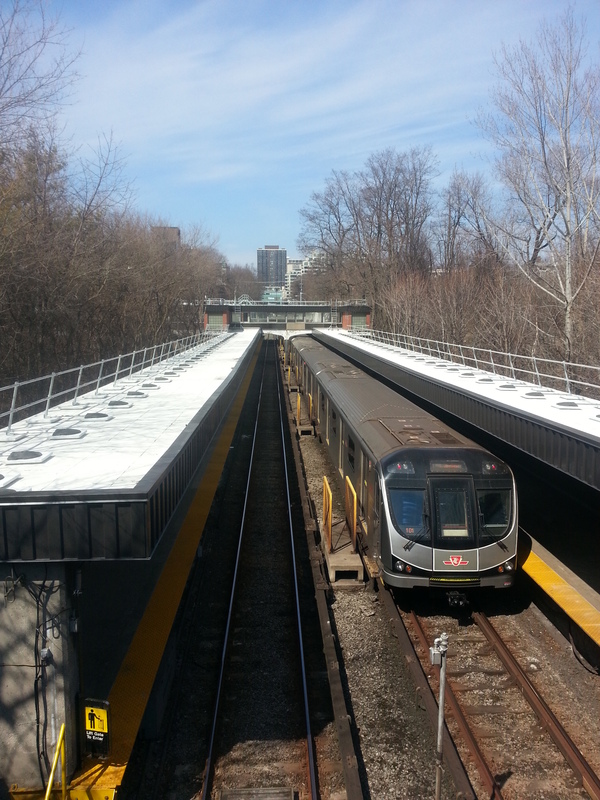 I stop for a moment to watch the trains roll in and out of Rosedale Station and then cross Yonge. The street becomes Belmont and I’m liking the streetscape on either side of me. Other than admiring the charm, however, I do have another purpose for being here. 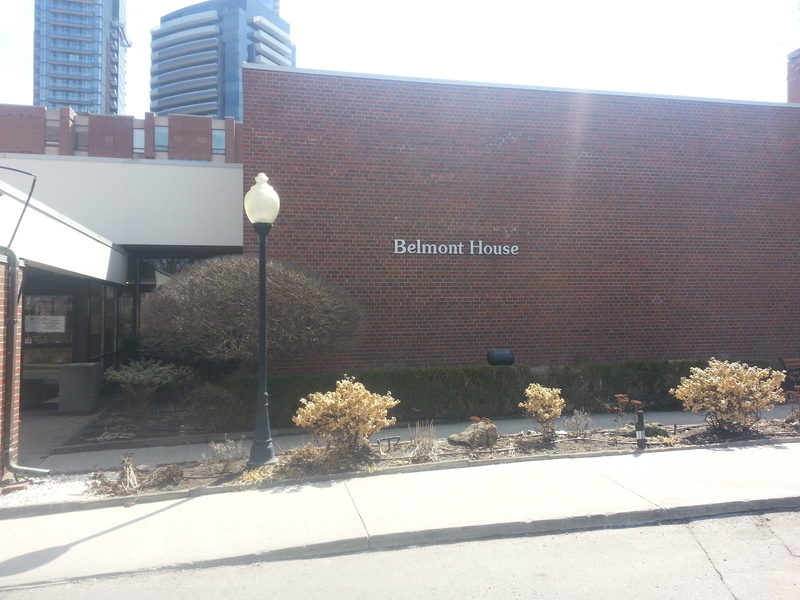 Belmont House is a retirement home and long term care centre built in the 60s. More interesting to its story is that it is built on the site of an Aged Men’s Home, Aged Women’s Home, and Magdalen Asylum & Industrial House of Refuge. The latter establishment is most fascinating. On first glance at the name, it doesn’t sound like a particularly good place – asylums generally don’t provoke the best connotations and the Biblical character it’s named for isn’t always portrayed in the best light either. The ever trustworthy Wikipedia tells that Magdalen Asylums are not just a Toronto thing. 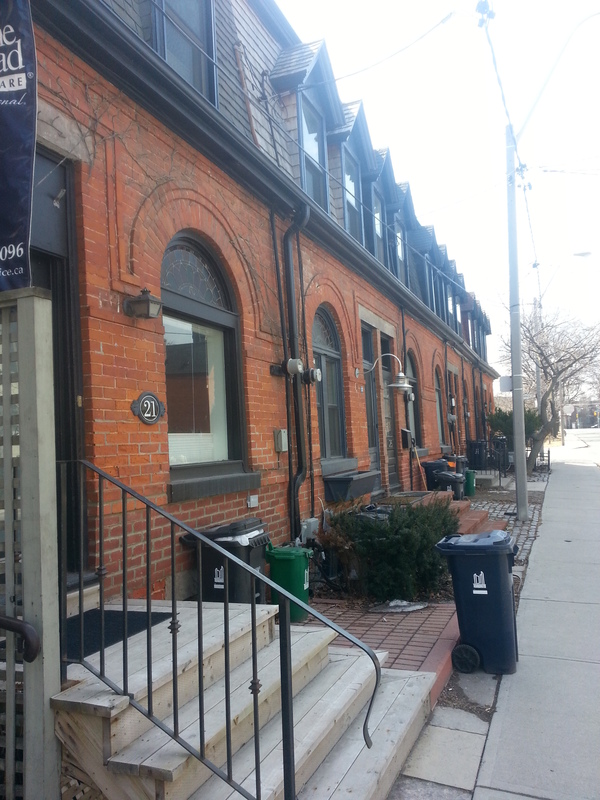 Its history, however, promotes it as a place of care for homeless women and I suppose I will take it as such. 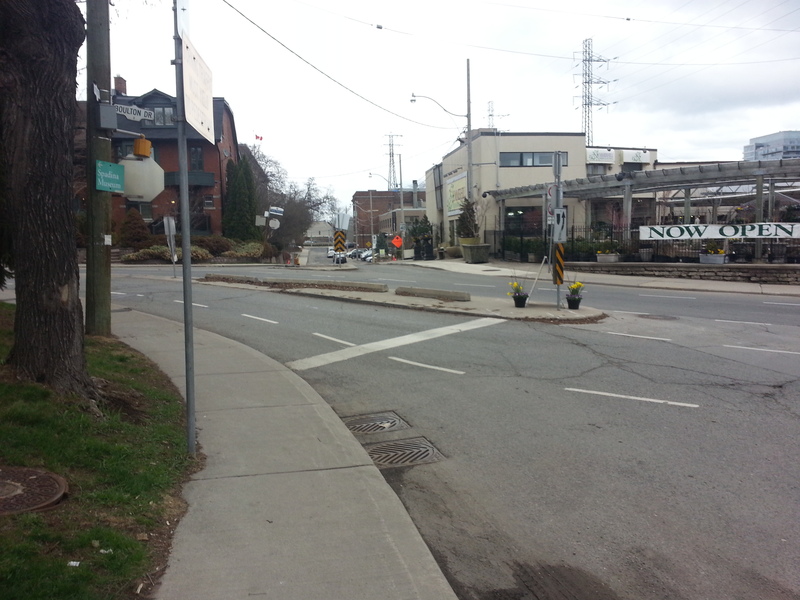 This detour completed, I circle back to Yonge Street and walk north. 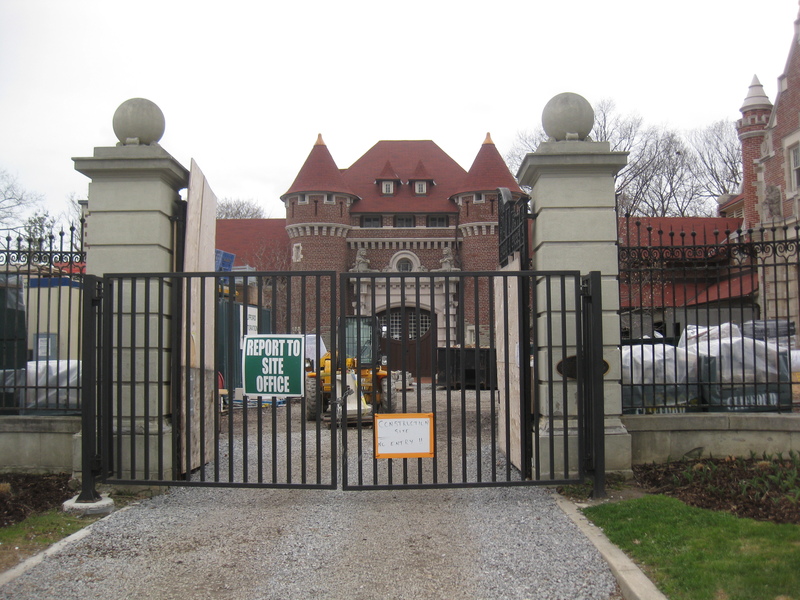 I turn onto Ramsden Park, the former site of 19th century brickyards. Castle Frank Brook ran through here too, the riverbed making for rich clay deposits. The park’s uneven, dug-in landscape is the only remnant of its industrial past. (And here I’ll shamelessly plug my Industrial Heritage Map). There’s also a few stubborn remnants of winter in a file snow piles that refuse to acknowledge the existence of spring. 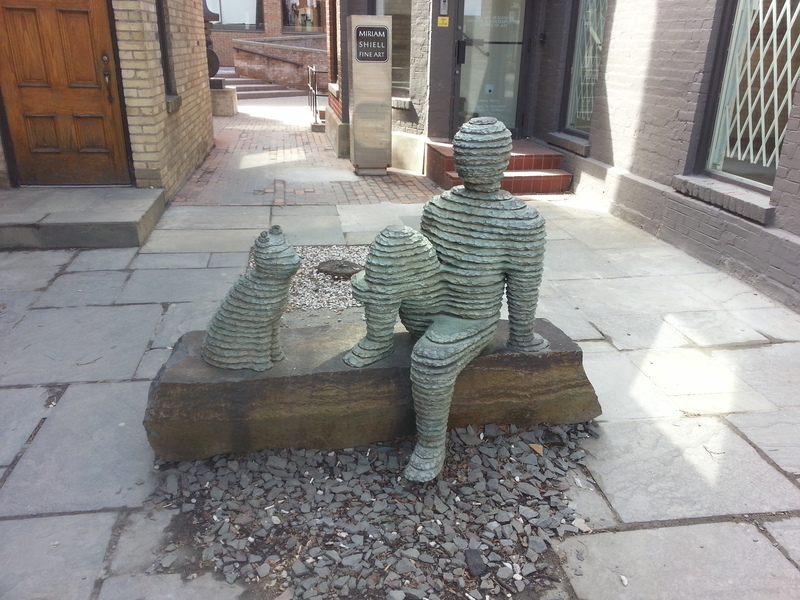 Yorkville Brickyards. Source: Goad’s Atlas, 1884. 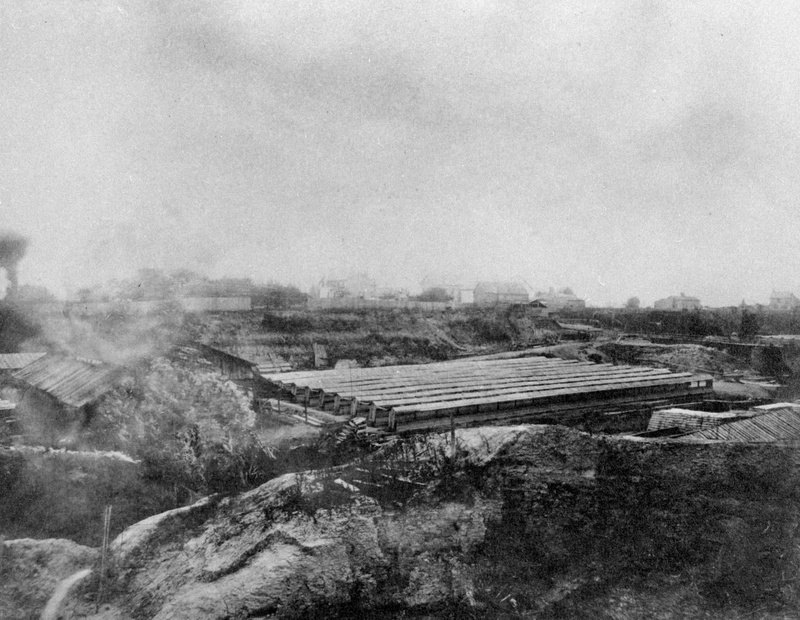 Yorkville Brickyards, 1880s. 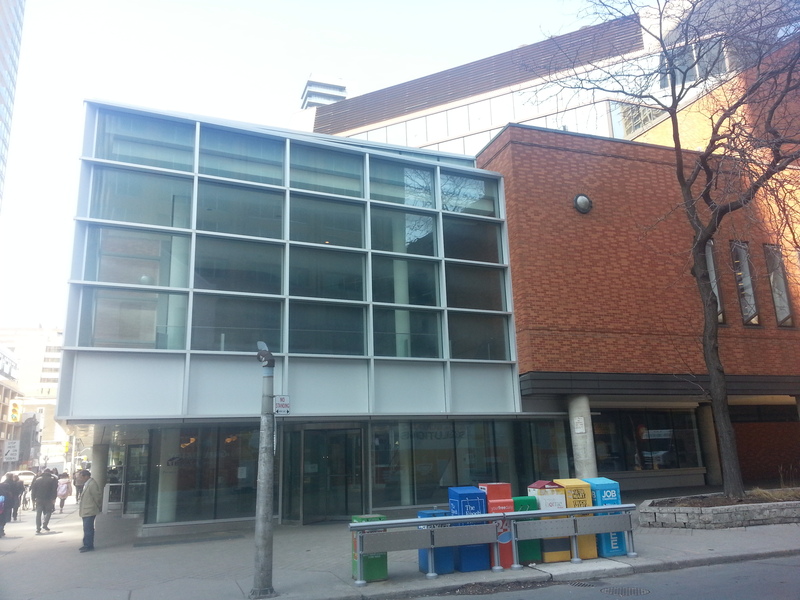 Source: Toronto Public Library. 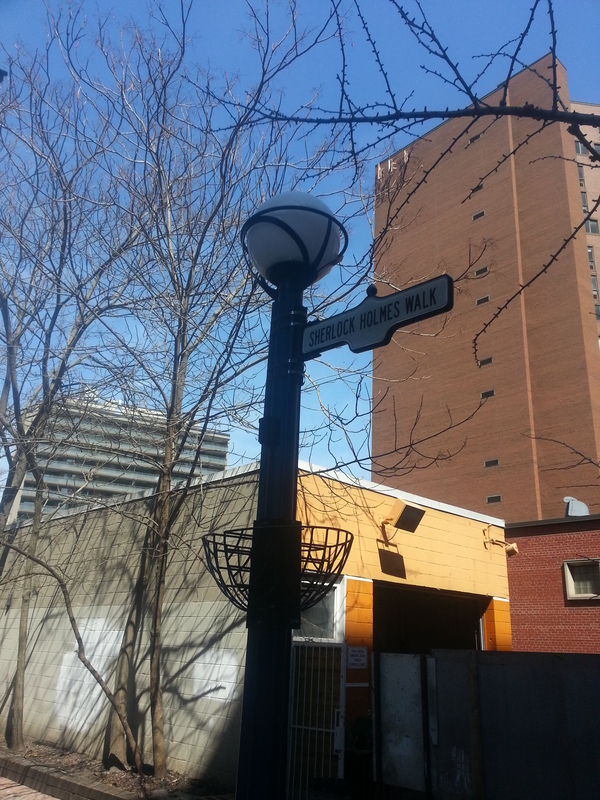 Pears Street, which runs adjacent, is named for one of the brick makers. 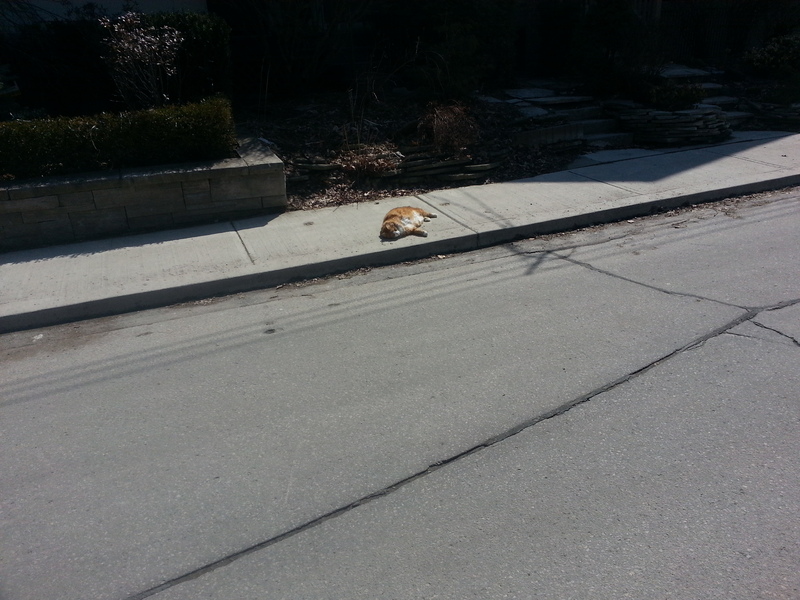 A cat lounges on the sidewalk and soaks up the sun. He has the right idea. I eventually hit Avenue Road. 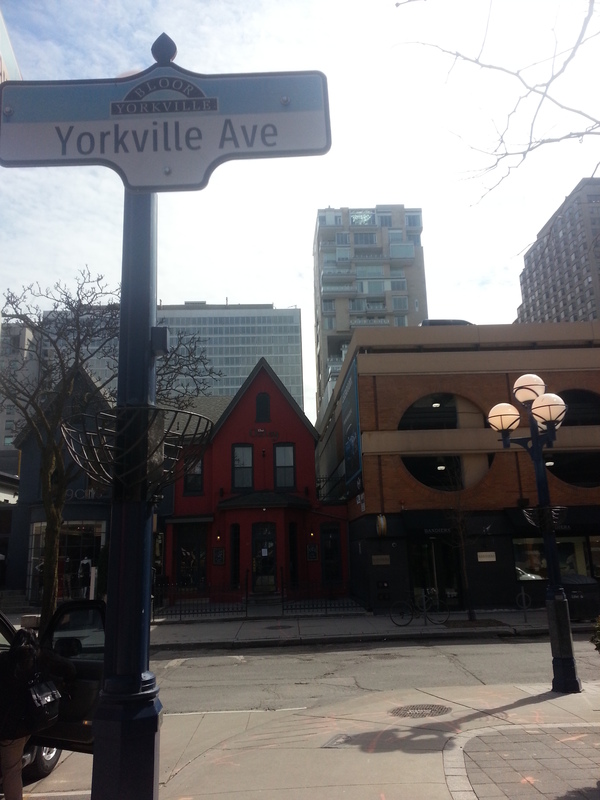 Across the way is 174 Avenue, otherwise known as the Village Corner in the 1960s Yorkville folk scene. 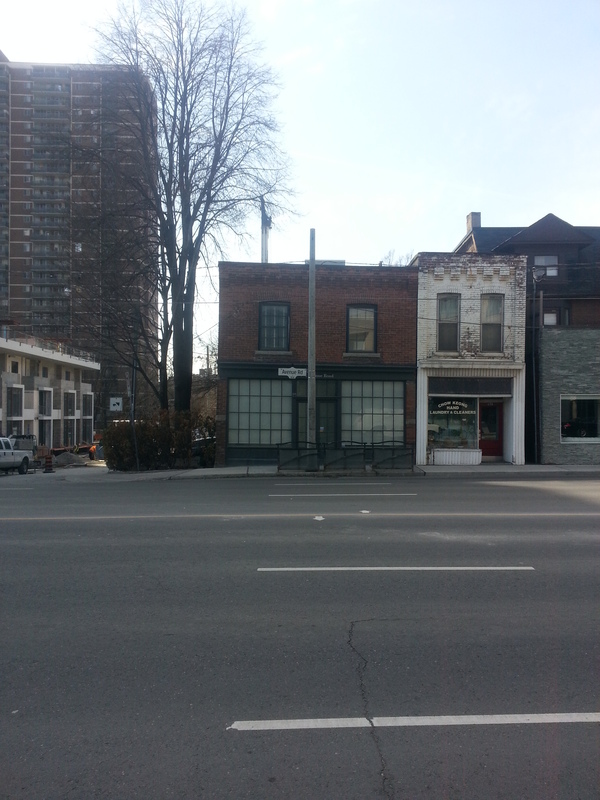 The Village Corner gave the first break to Ian & Silvia and a young Gordon Lightfoot in 1962. 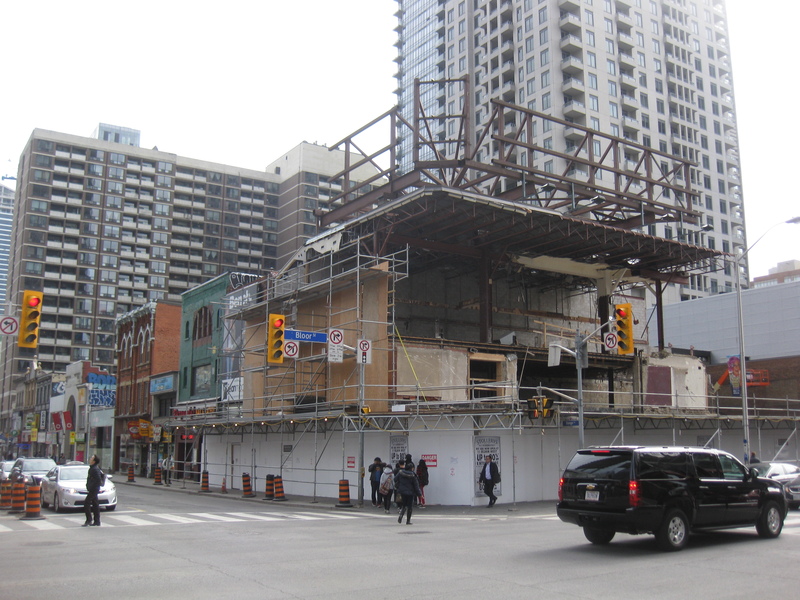 For more on Gordon Lightfoot’s Toronto, look here please. 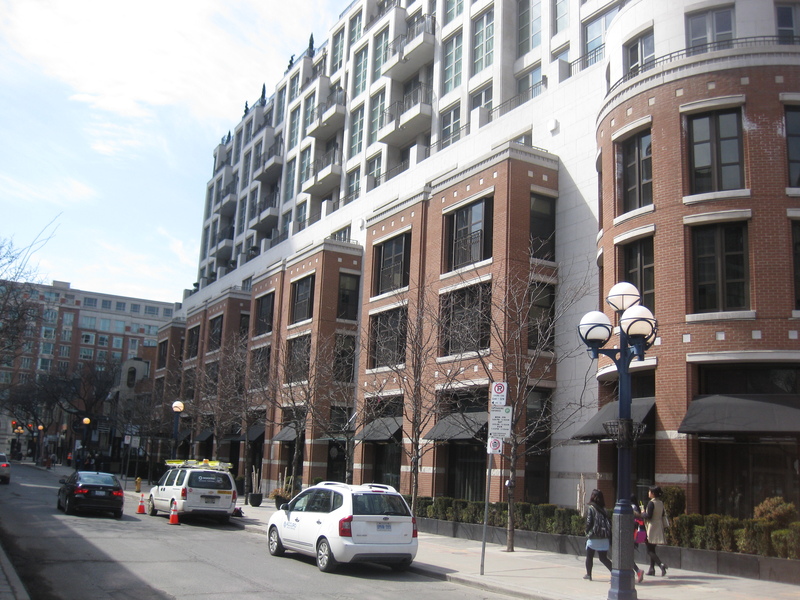 With a skip down the street and a turn onto Hazelton Avenue, I’m onto more familiar settings when it comes to the neighbourhood of Yorkville. 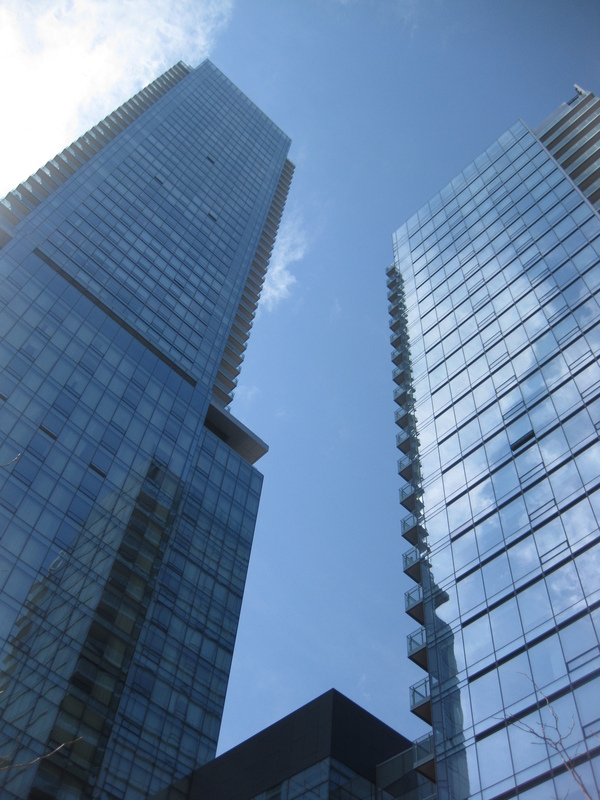 Hazelton is considered part of the heart of the Village and is pretty much an architecture lover’s dream. Bay and Gable, Gothic, Worker’s Cottage…it’s hard not to dream while being here. Alas, I stop myself from getting too ‘in the clouds’. The southern end of the street has a more commercial character. 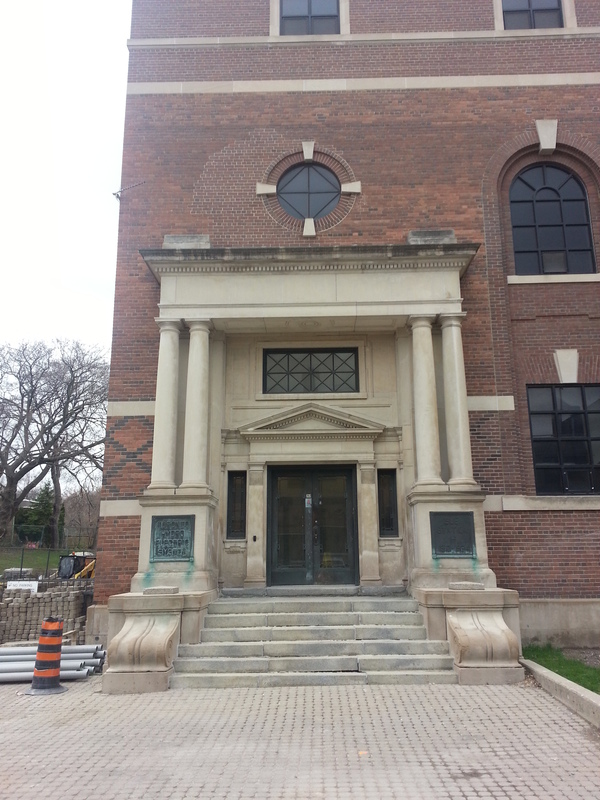 It features Heliconian Hall, the second National Historic Site of the day (and, like the Studio Building, also holds dual heritage recognition). 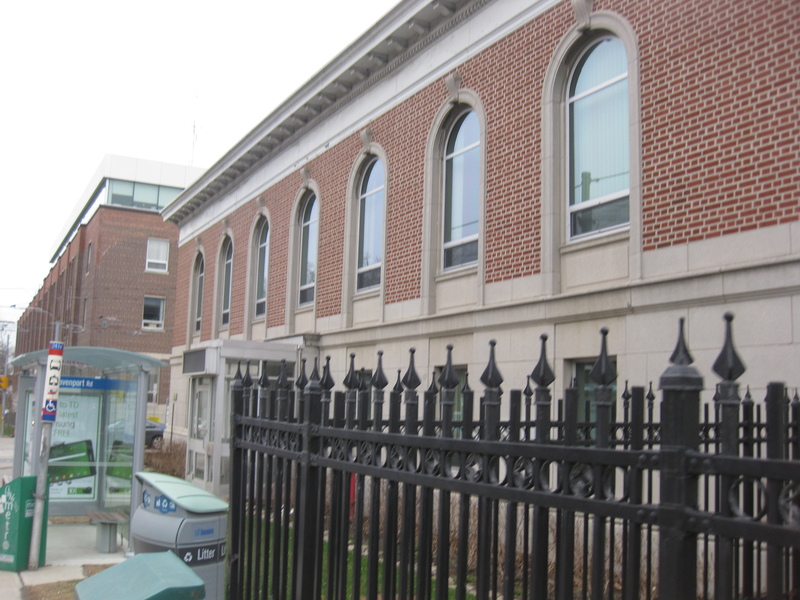 The Hall is the counterpart to a place like the Arts & Letters Club on Elm Street in that it was originally a professional association for women when they were excluded from Arts & Letter Clubs. Today it is an event space. Across the way are a line of boutiques and neat little street art. I lament at the sight of one characters wearing a Leaf jerseys. Somehow the ‘maybe next year’ saying isn’t appropriate. 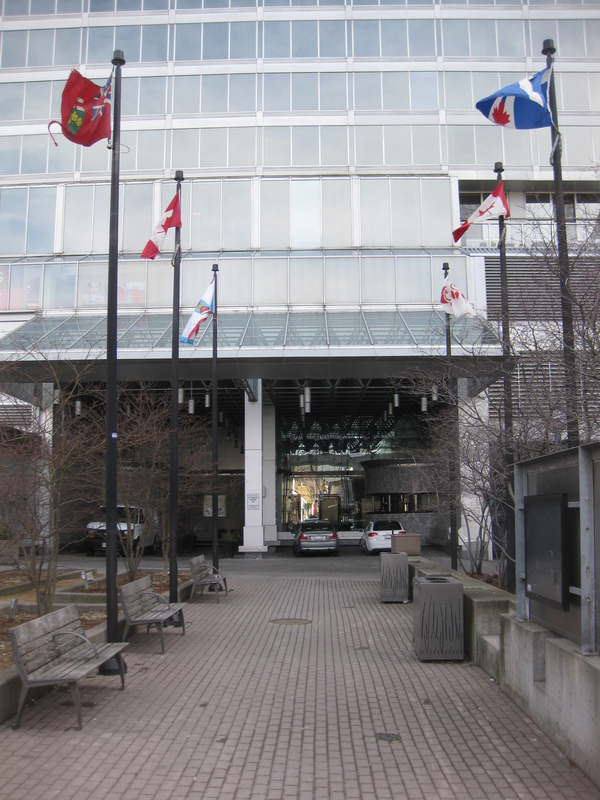 They are also the lead in to Hazelton Lanes, the premiere mall of the Village. I follow the street east, passing the first Mount Sinai Hospital (1922) and the Sheriff’s House (1837) on either side of the street. I peek down Bellair and inwardly judge the patio-ers. I know it’s a sunny day and there’s a certain desperation for more welcoming climates, but it is still very chilly and not quite patio weather. 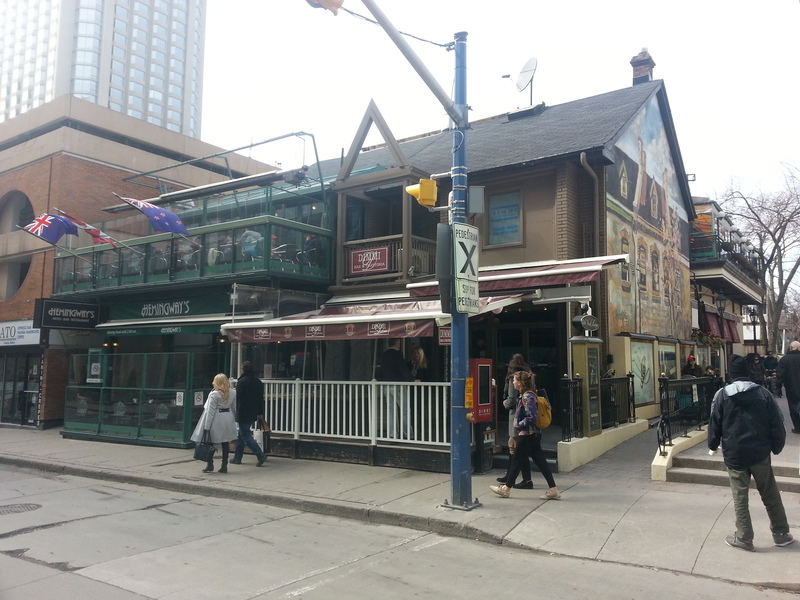 Moving on, the wideness of Bay Street to me breaks apart the neat, quiet street vibe. 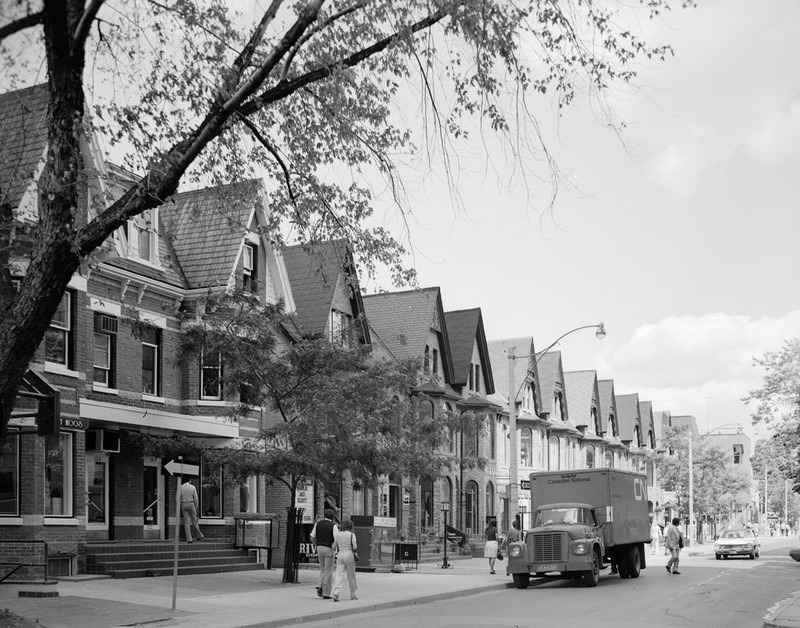 It’s no wonder that, like Church Street, it didn’t always run through Yorkville. 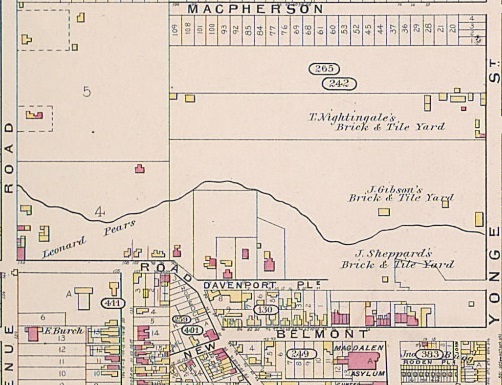 Bay was extended north to Davenport in 1922. 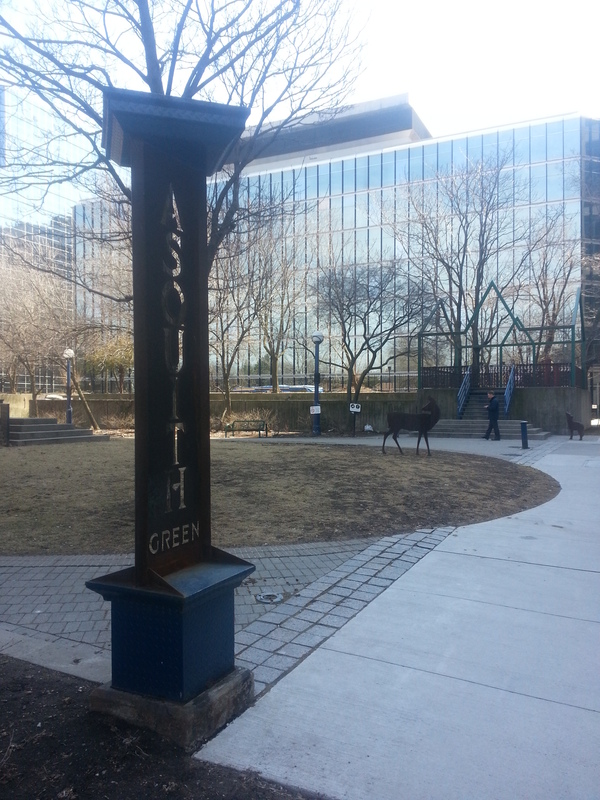 In any case, I cross it and pass the shiny and blue Four Seasons Hotel (which might be my favourite tall towers in the city) and its adjoining parkette. 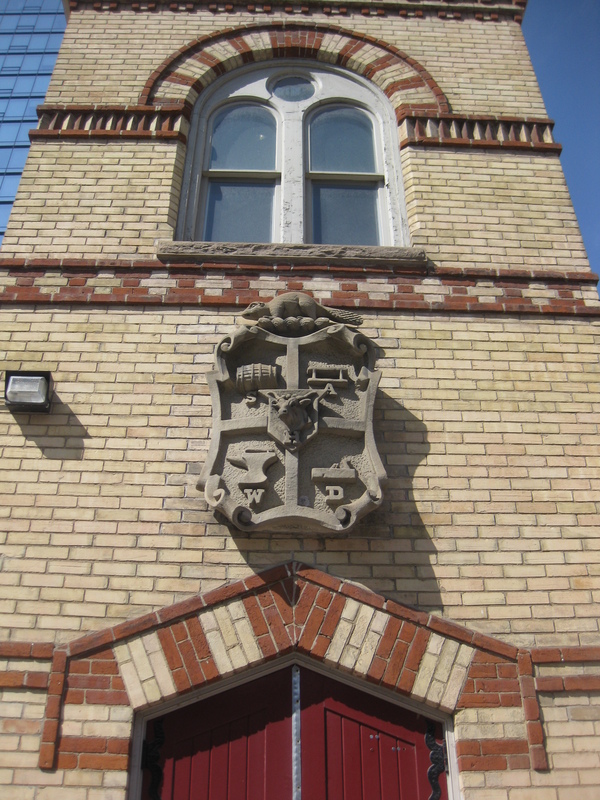 Beside is Fire Hall #10, 1890, which displays the Yorkville Coat of Arms. 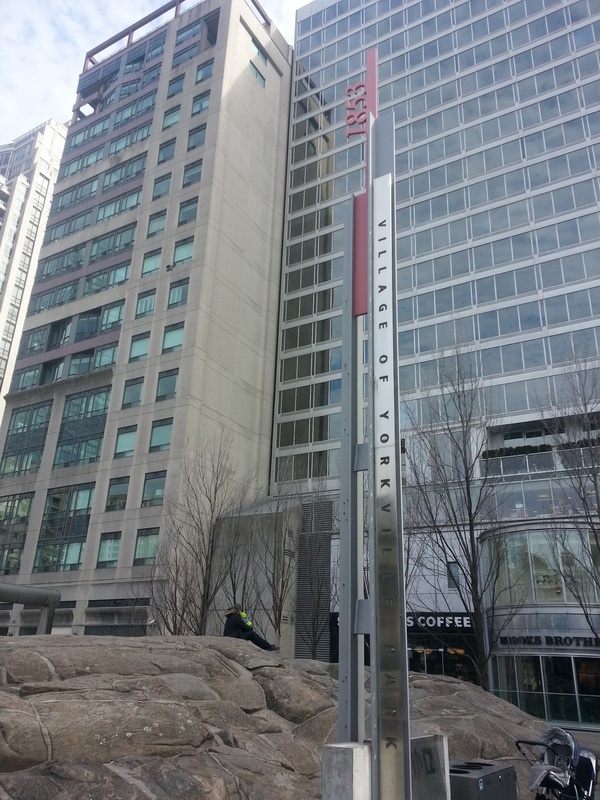 The emblem was once located a stone’s throw away at the now lost Yorkville Town Hall on Yonge Street. Decked on the coat of arms are symbols of early industrialists that built the Village, including our friend Severn the brewer. Beside the fire station is Yorkville Library, 1907. This Beaux-Arts gem is one of the famed Carnegie Libraries. Adjoined to it is Town Hall Square Park, which, and I know parks come in different forms and sizes, but isn’t too park-ish too me. Maybe users of the park, like the woman promenading around with her dog, disagree. 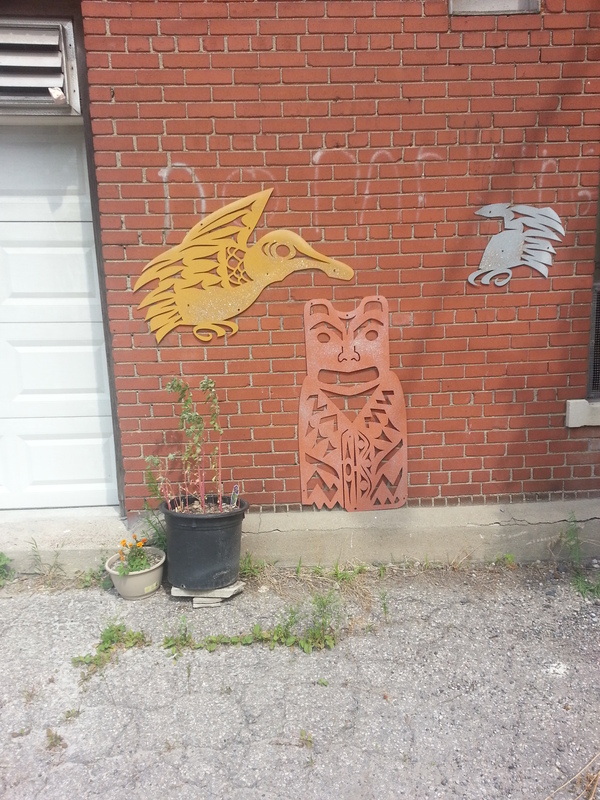 I leave the area and head down a laneway to Cumberland. Cumberland Terrace is to my left. It’s a bit of an oddity within its surroundings. 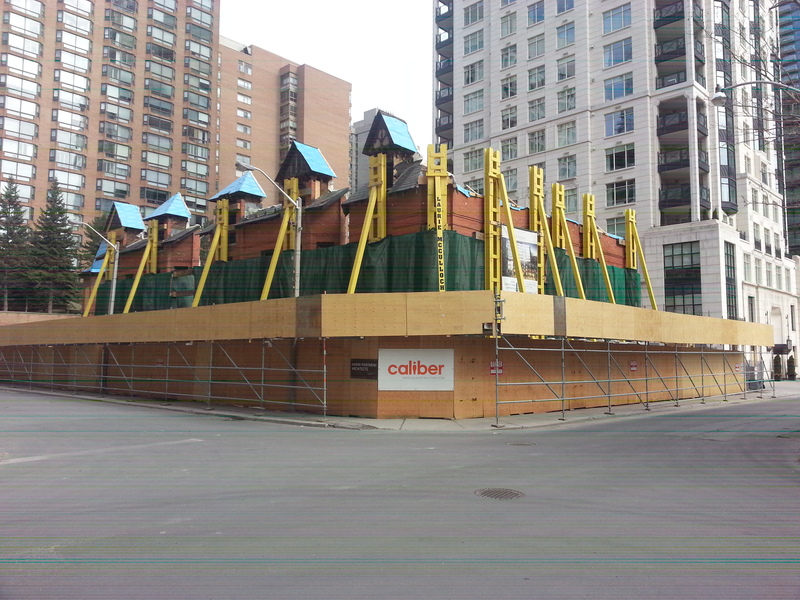 It might have fit in well in 1970s when Yorkville was beginning its gentrification, but now it’s a bit of a tacky sour thumb. 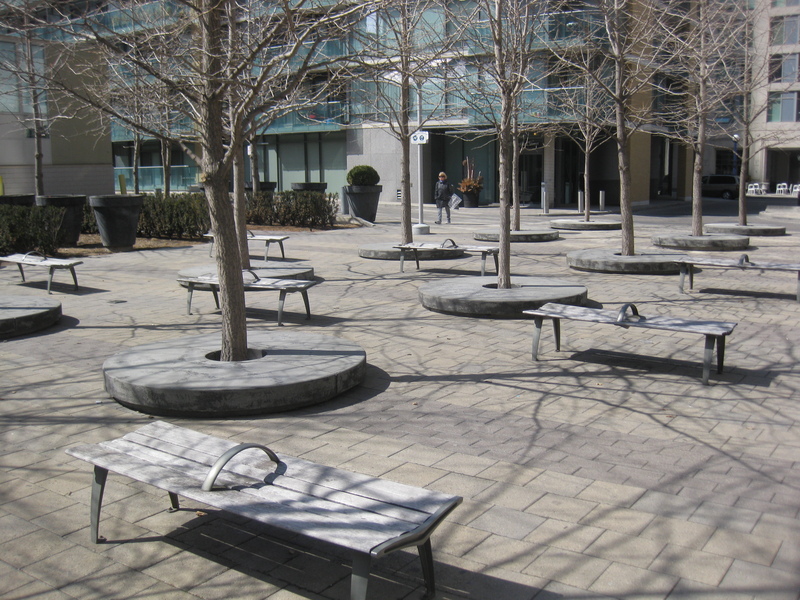 Village of Yorkville Park (doesn’t really roll off the tongue, does it?) is a bit of an oddball park too. It’s meant to represent the diversity of Canadian landscapes from coast to coast. I wouldn’t have known this if I had not read it. The highlight for most people is the giant rock which represents the Canadian Shield (and actually the hunk of rock really did come from the Canadian Shield!). 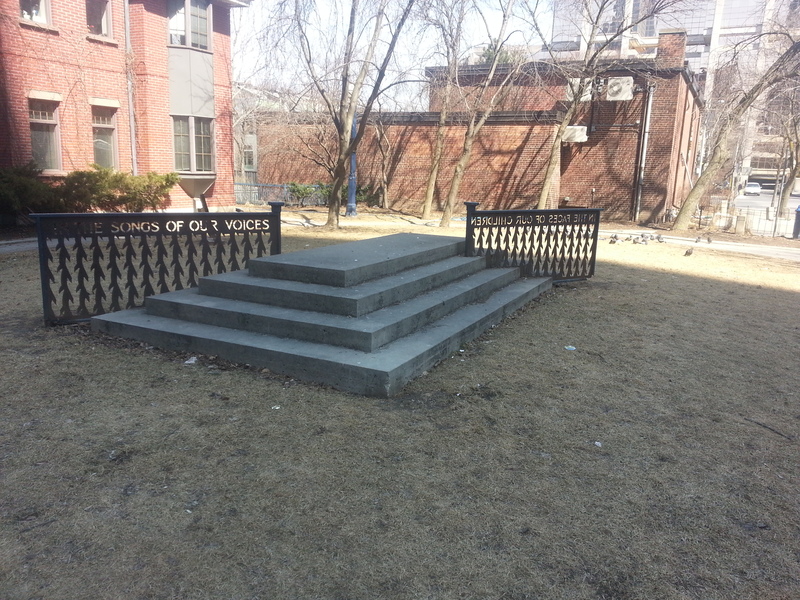 I take a seat on some nearby rest points, and, as the subway rumbles under me, I recognize that park does it’s job. It’s well used and a meeting point for people. It’s excellent for people watching, for example the people lining the other side of the street and sitting in the patio of Hemingway’s (more internal judgement). 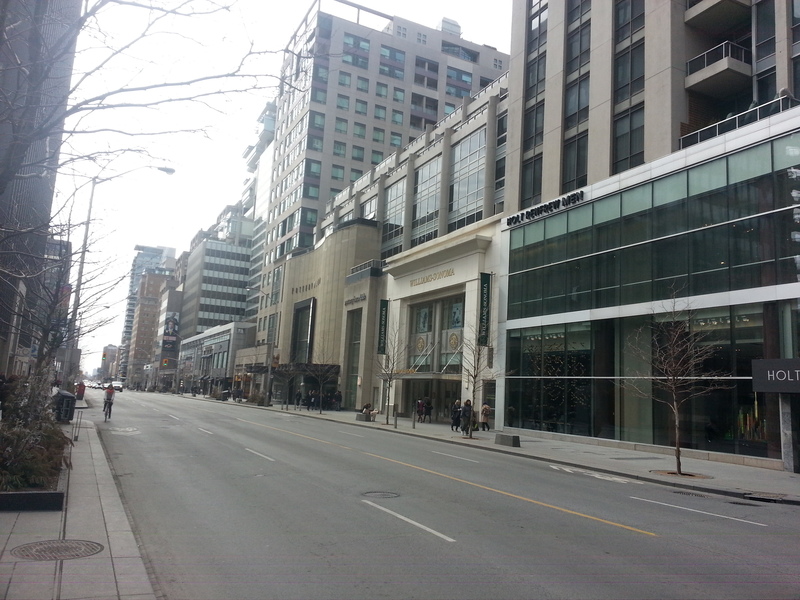 Down Bellair I go and I’m at Bloor Street. Needing to cross the street, I head towards Bay. 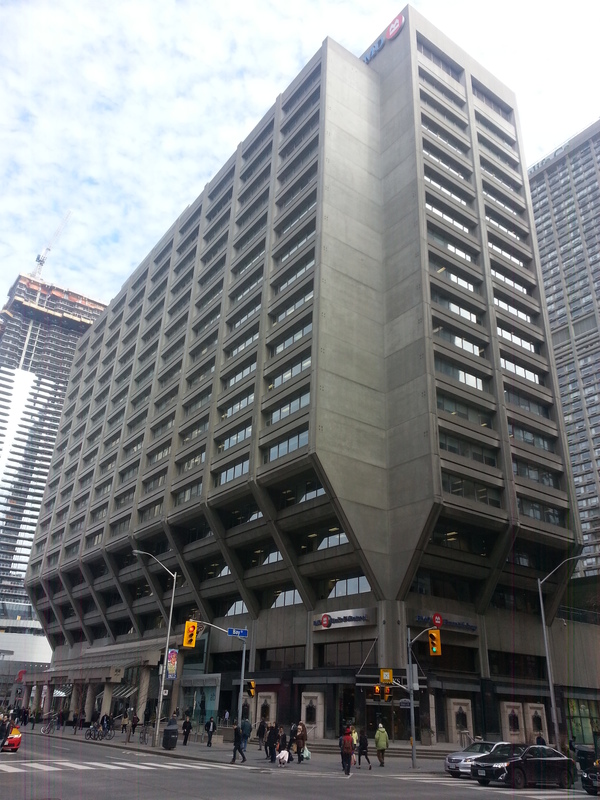 The Manulife Centre, 1974, presides over the intersection and its ill-fated scramble crossing. 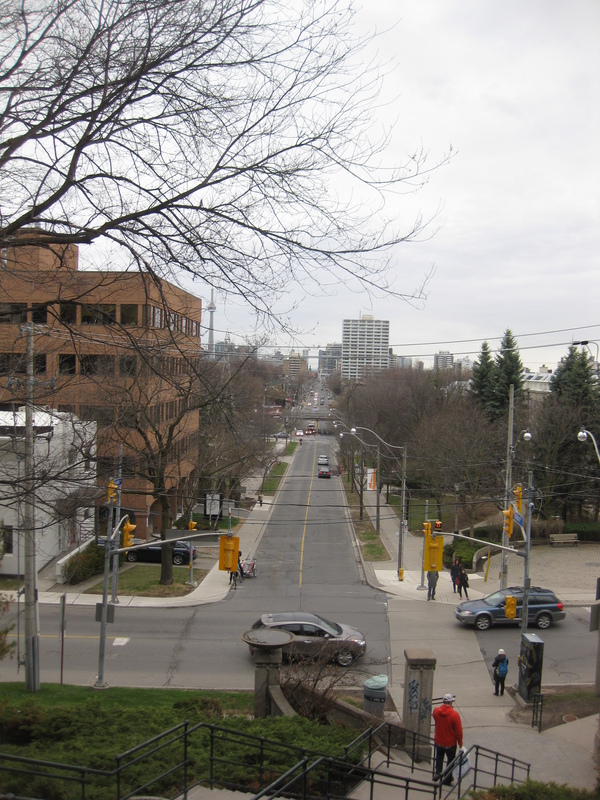 From mynew location, I get a good view of the ‘Mink Mile’ that is Bloor. 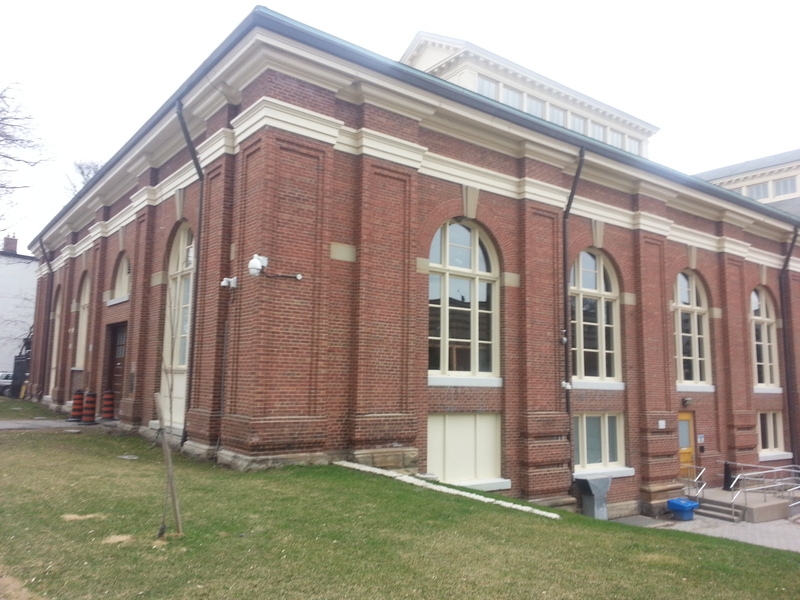 A noted spotting is the Pottery Barn, whose facade alludes to its prior incarnation as the University Theatre. 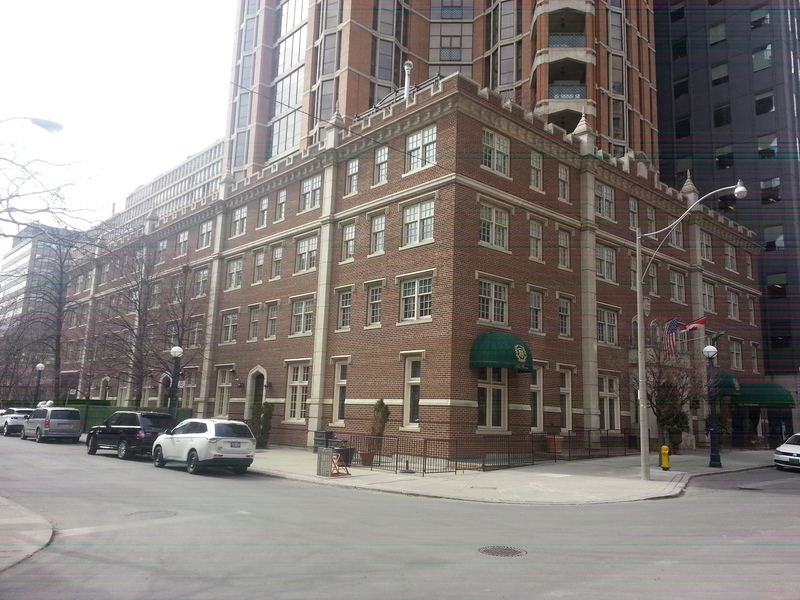 I take a little detour down St. Thomas and catch a look at the sophisticated Windsor Arms Hotel, 1927. It actually reminds me of a fortress. 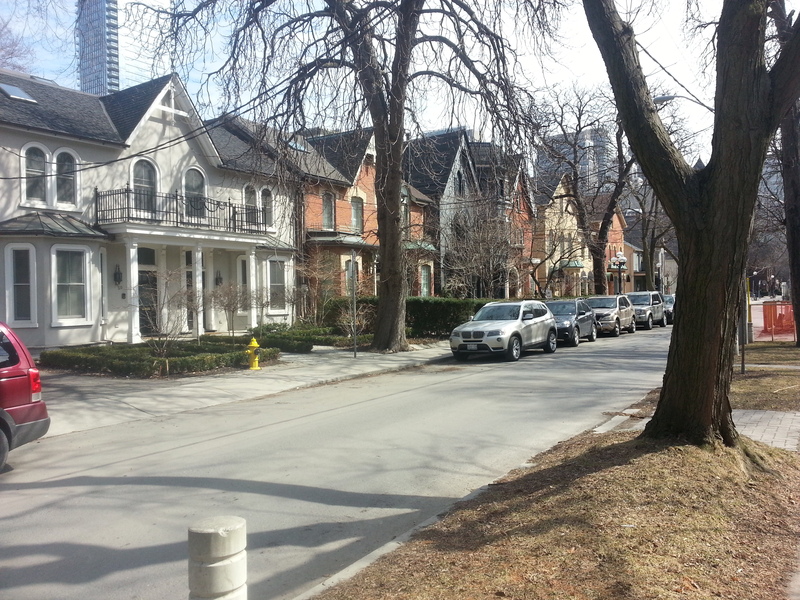 This area wasn’t part of the original Village of Yorkville, but as mentioned earlier, borders have expanded and contracted, and somehow the area south of Bloor is lumped into Yorkville. 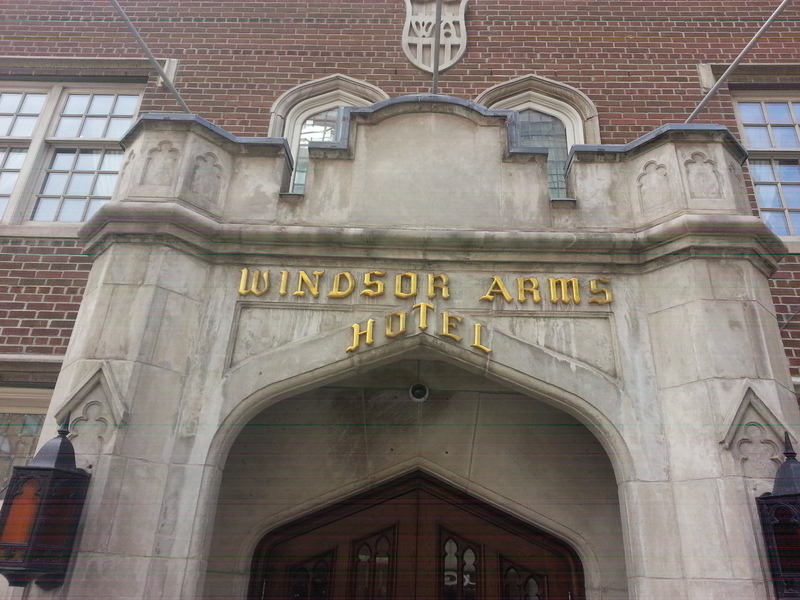 The Windsor Arms fits in well with the swankiness of the neighbourhood anyways. 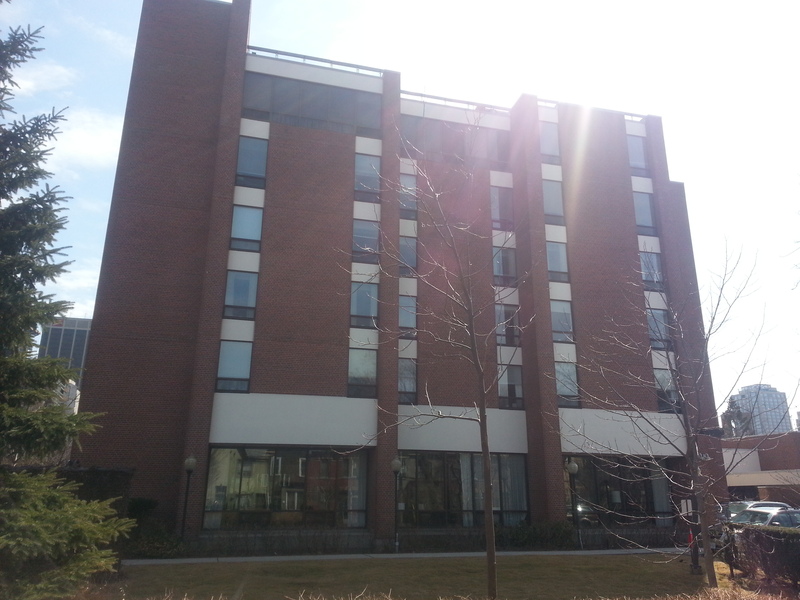 As I’m admiring and snapping pictures, a UPS driver buzzes the door of the adjacent University Apartment. He doesn’t find who he’s looking for. 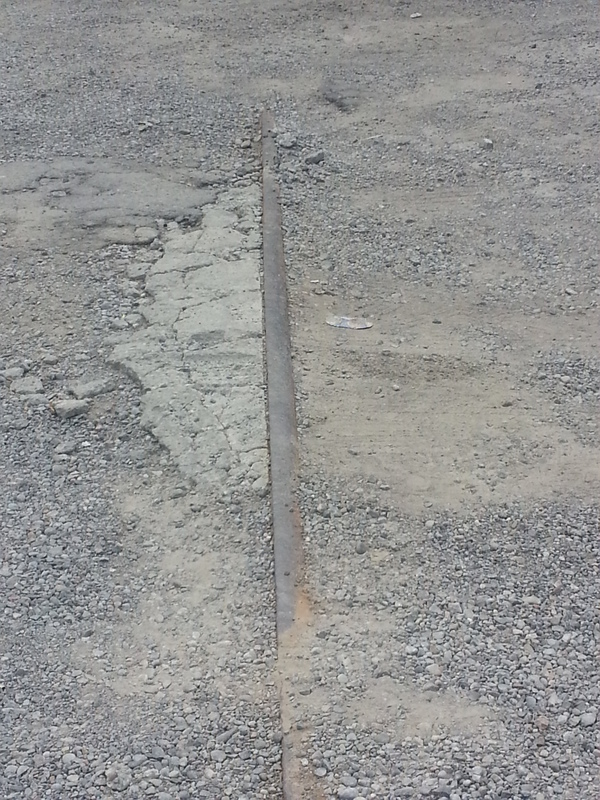 I have to let out an internal weep at what I see at the construction site on the opposing corner. 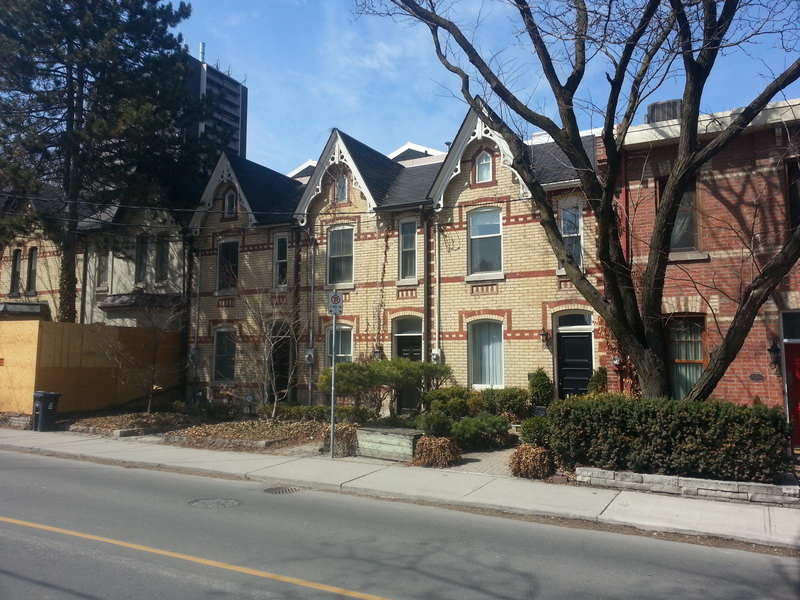 There are Victorian facades fronting an empty pit, and I realize we’re about to get a facadist (ie, cop out) approach to preserving the heritage elements to whatever development is on the way. Shame. 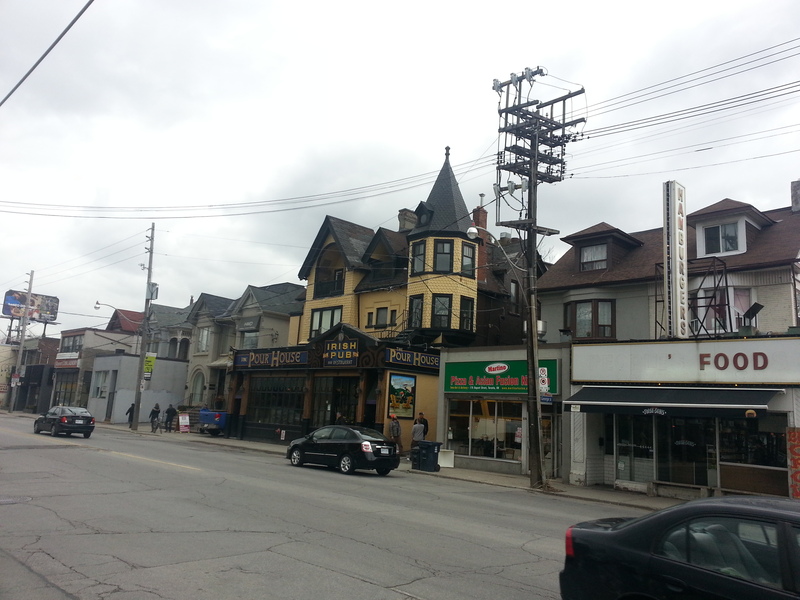 Back on Bloor, I make a mental cue for Pink Floyd because I’m off to Yonge to end things where they began. It’s actually a sad note, because, like the site of Sultan and St. Thomas Streets, I note with a frown at the ‘progress’ on the Stollery’s site and how poorly the demolition unfolded. 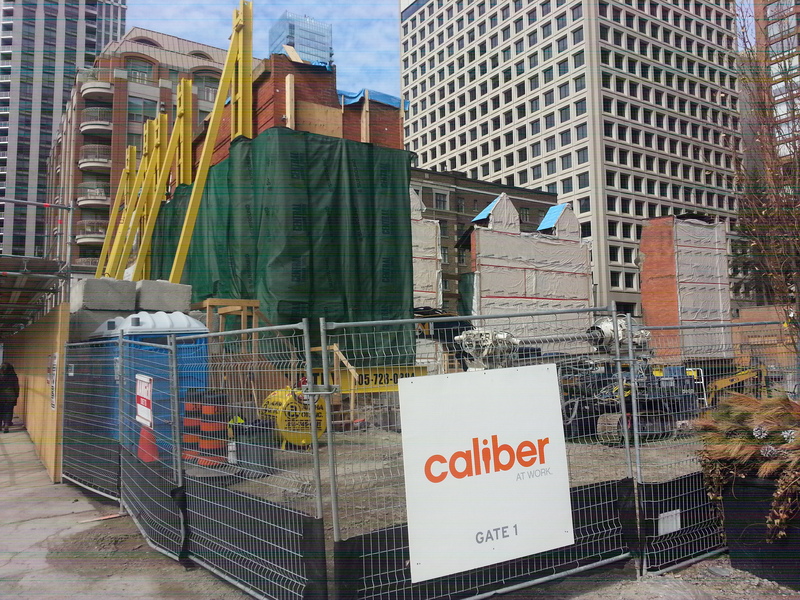 Across the way, One Bloor inches closer to completion.